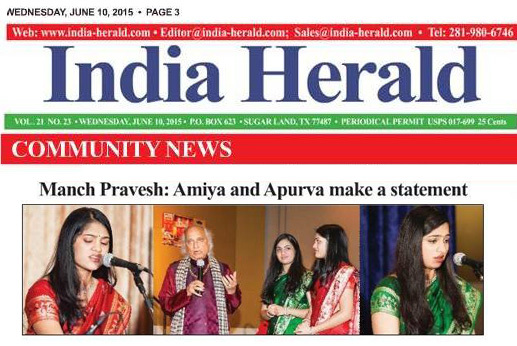 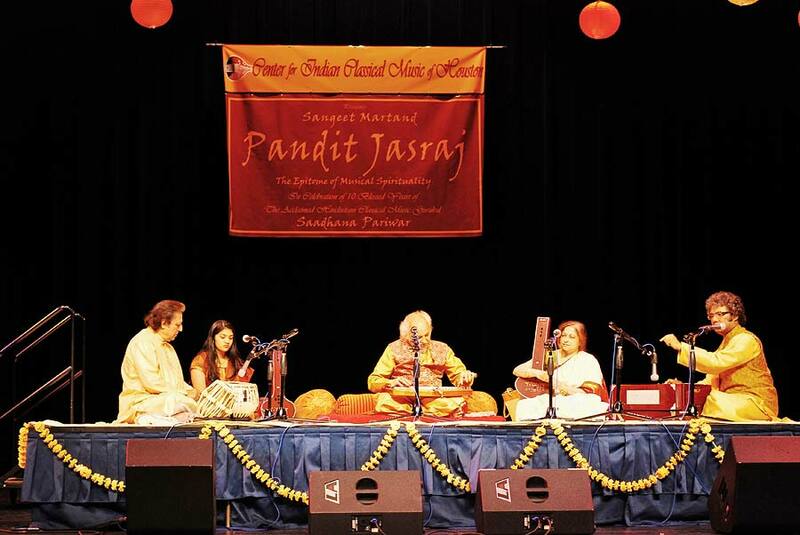 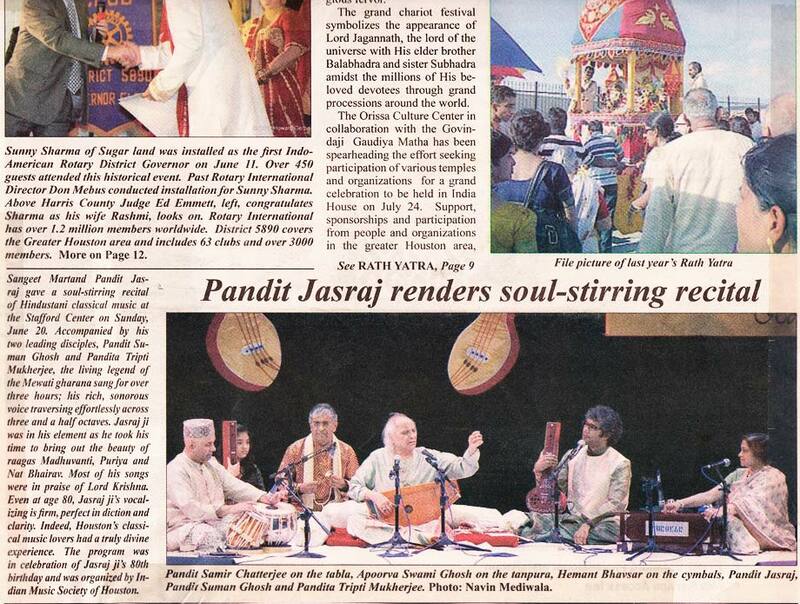 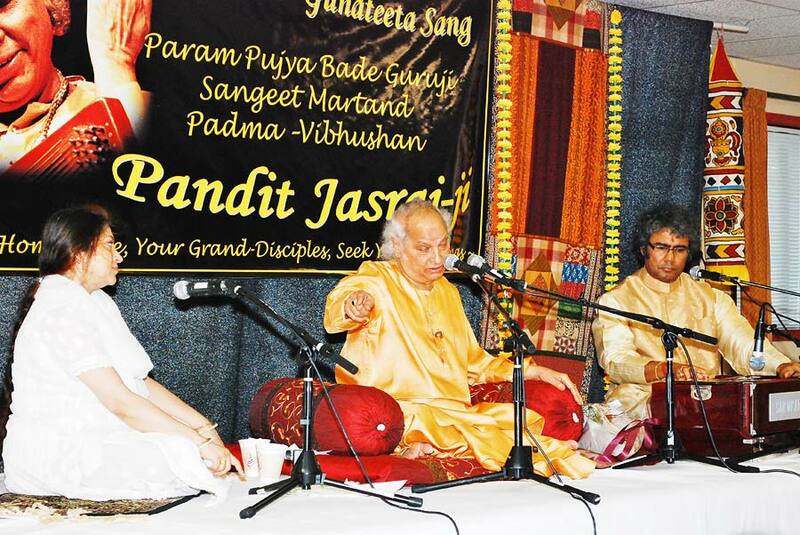 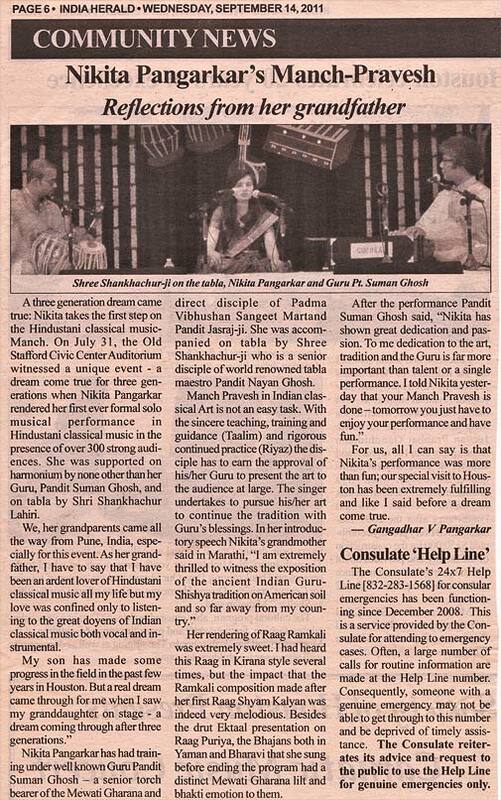 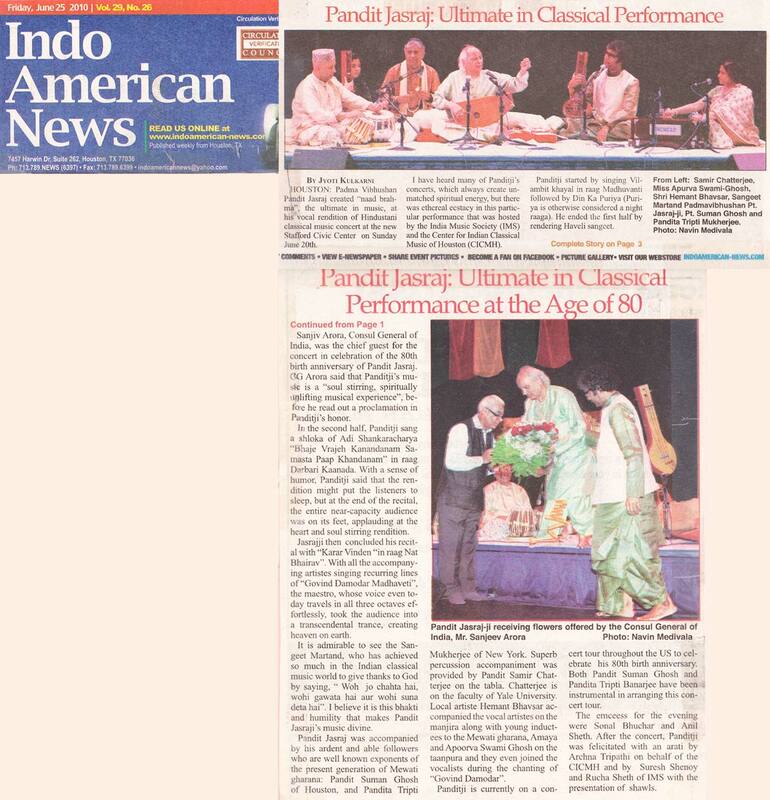 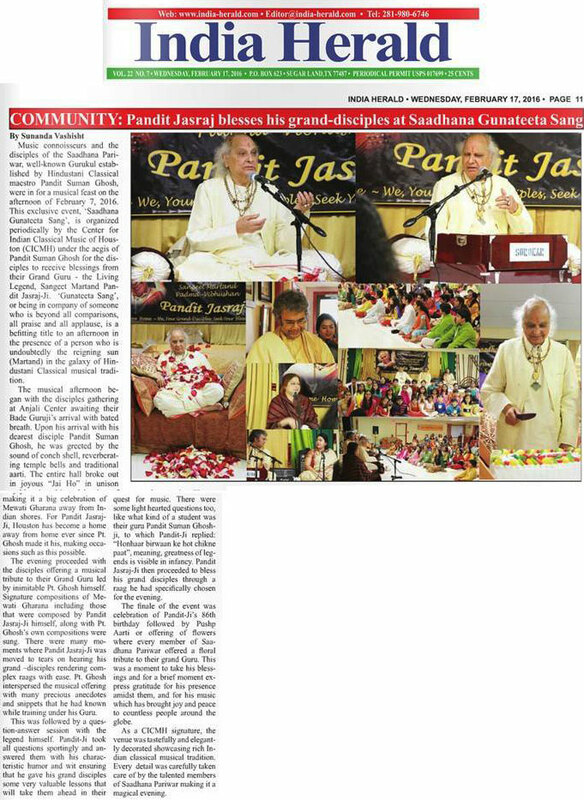 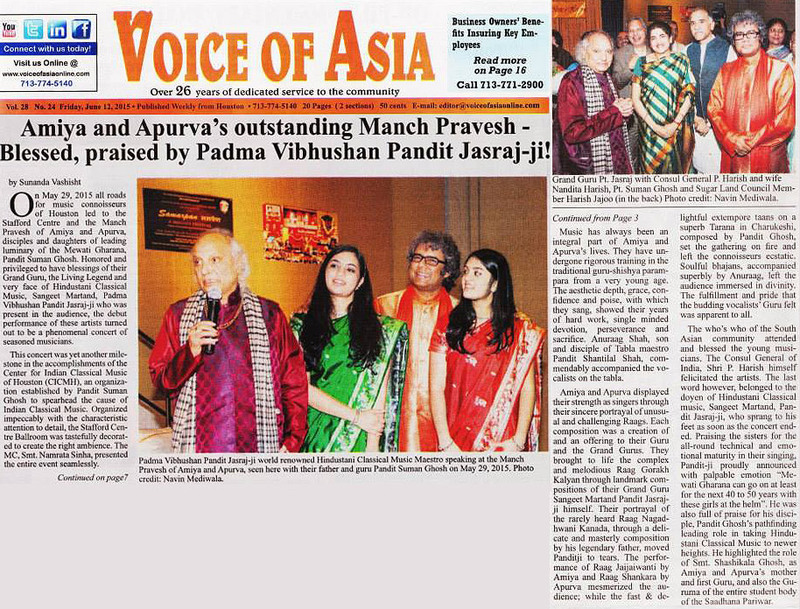 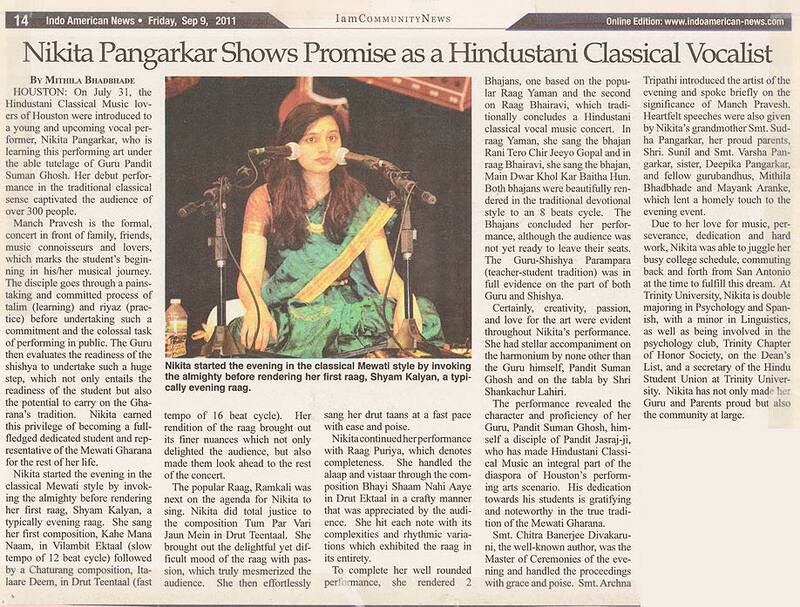 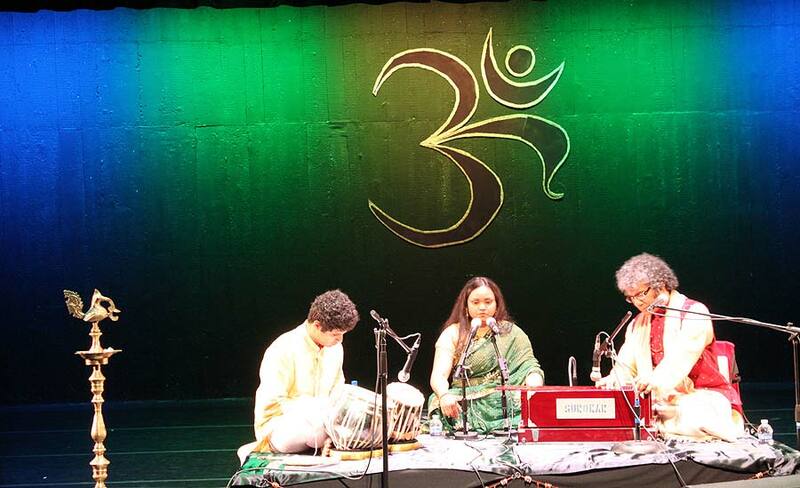 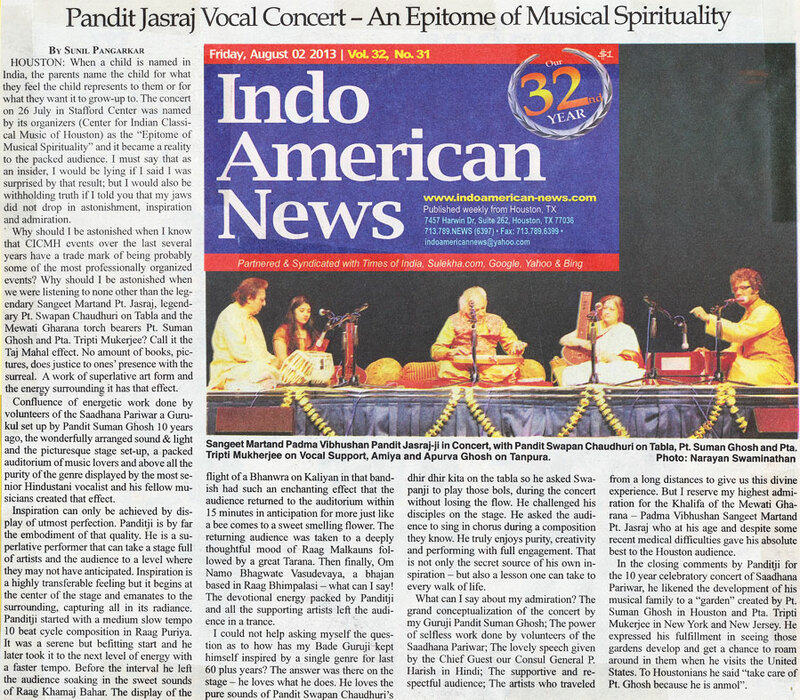 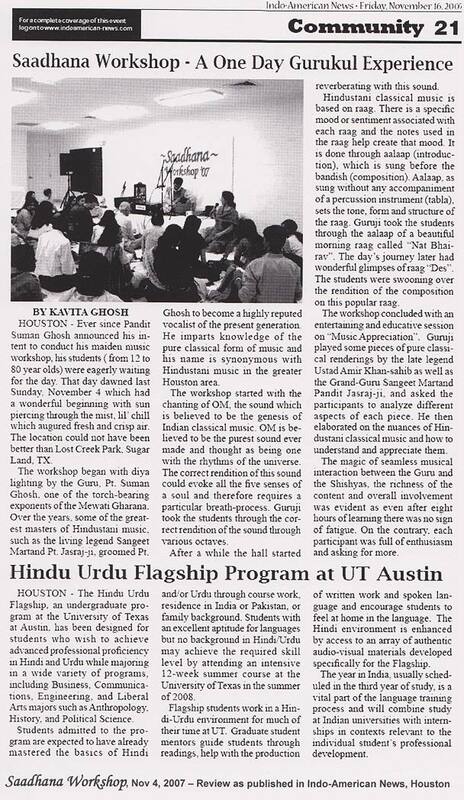 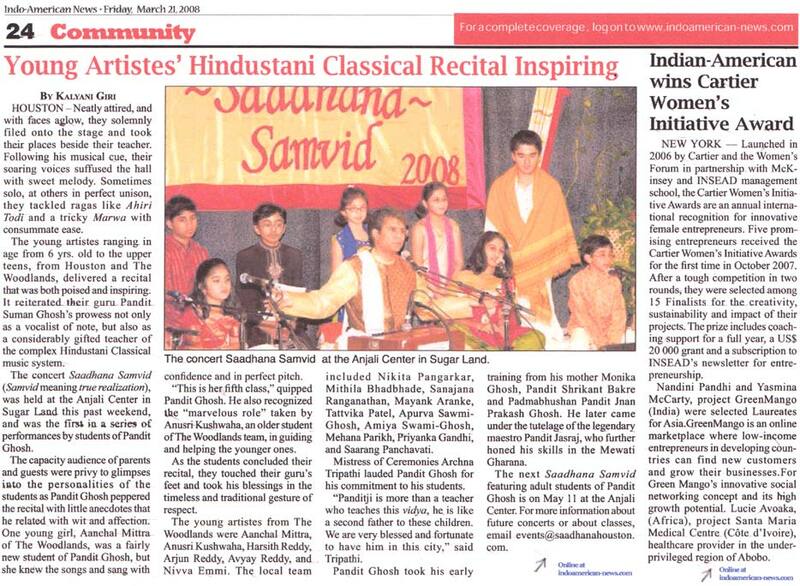 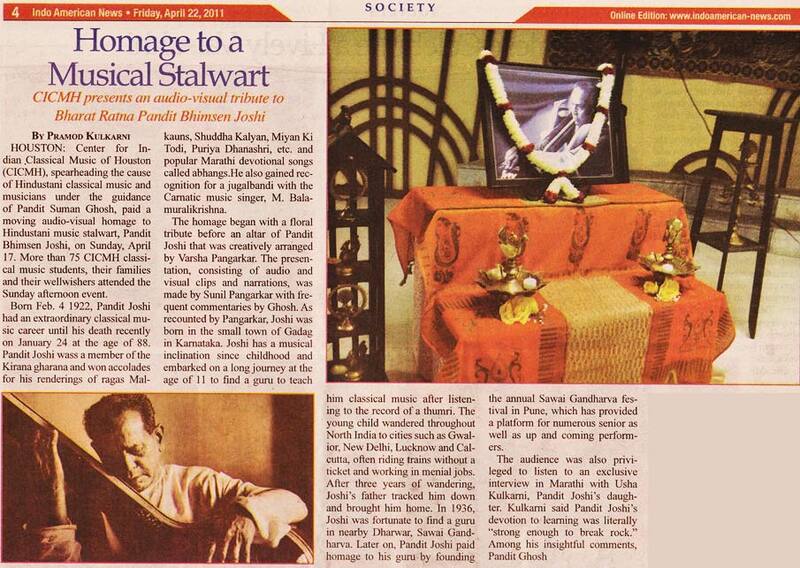 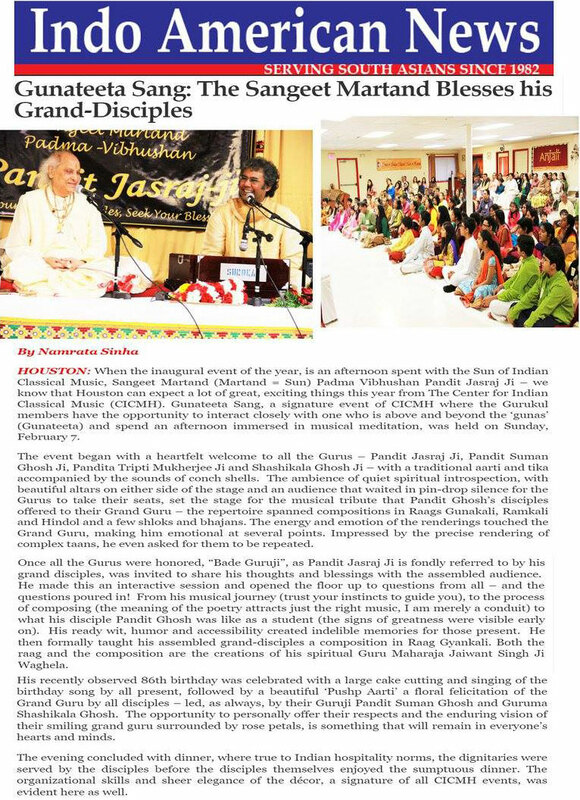 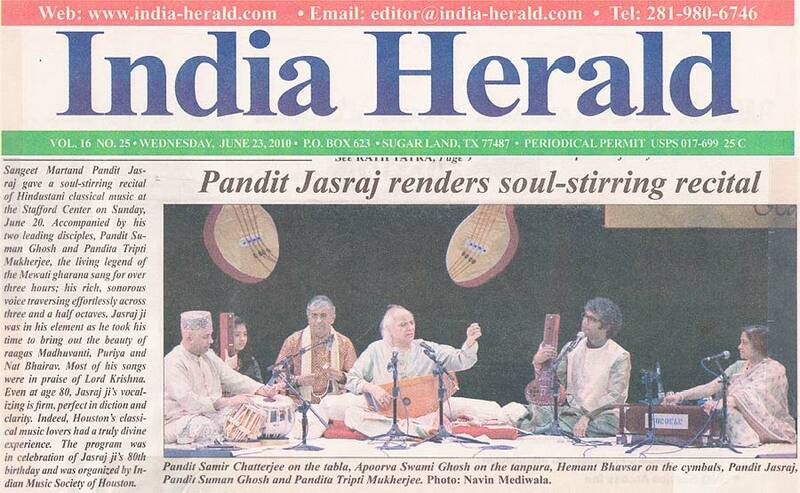 Pandit Ghosh firmly believes that, association with Hindustani classical music has far-reaching benefits, not only for individuals, but for the society at large, as its richness, depth and purity reach beyond realms of simple entertainment deep into the enrichment of the soul. 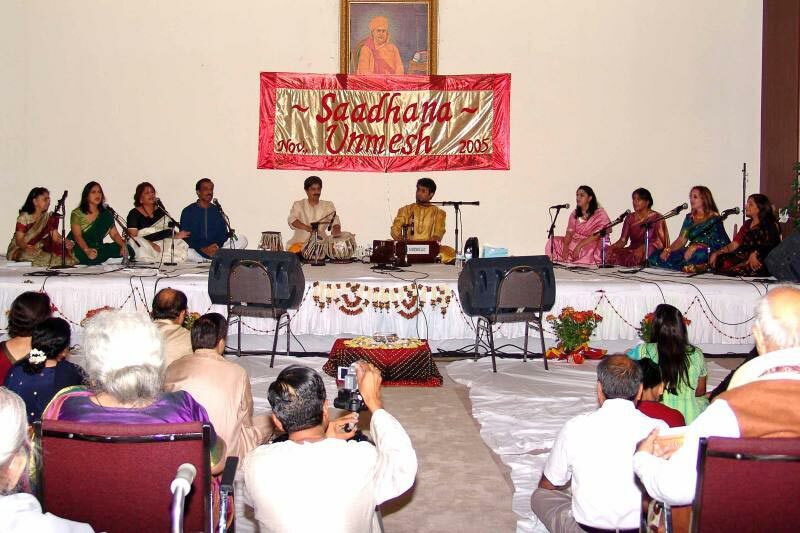 Such wide-ranging benefits can only be gained by a truly holistic view of this music. 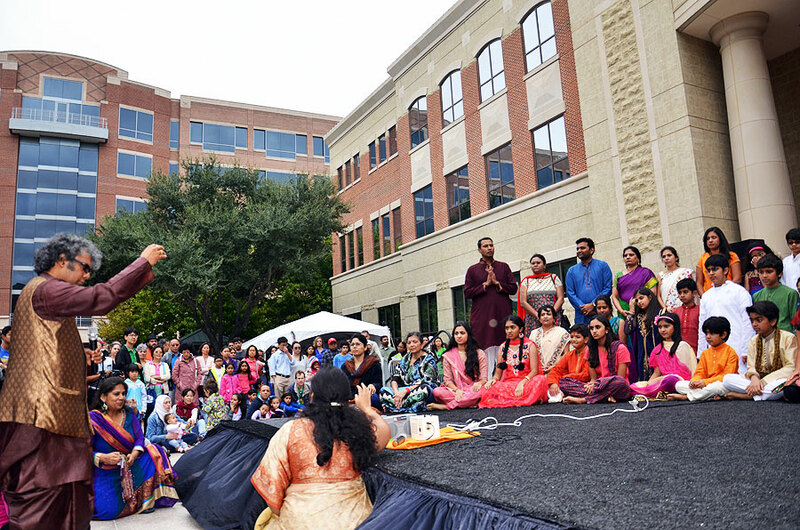 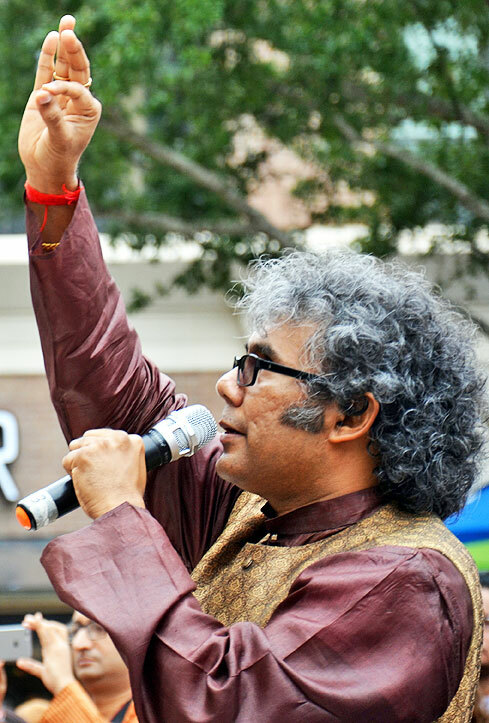 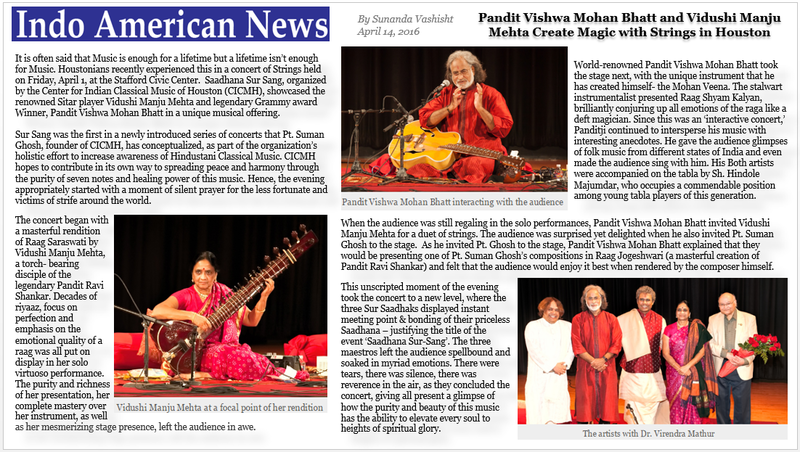 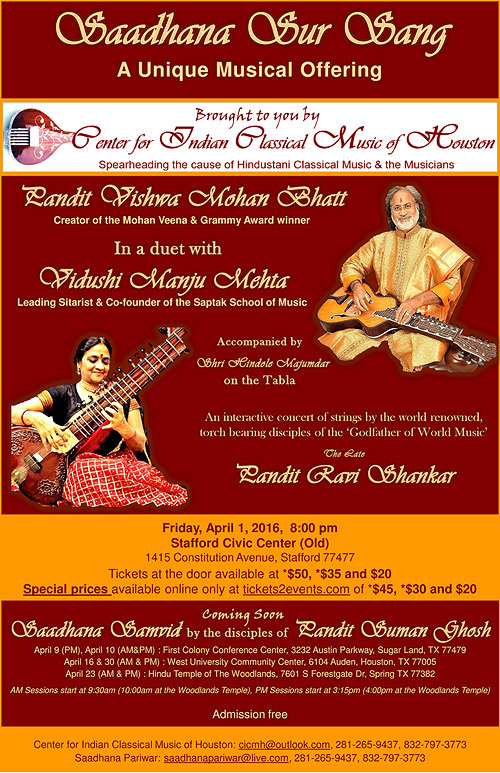 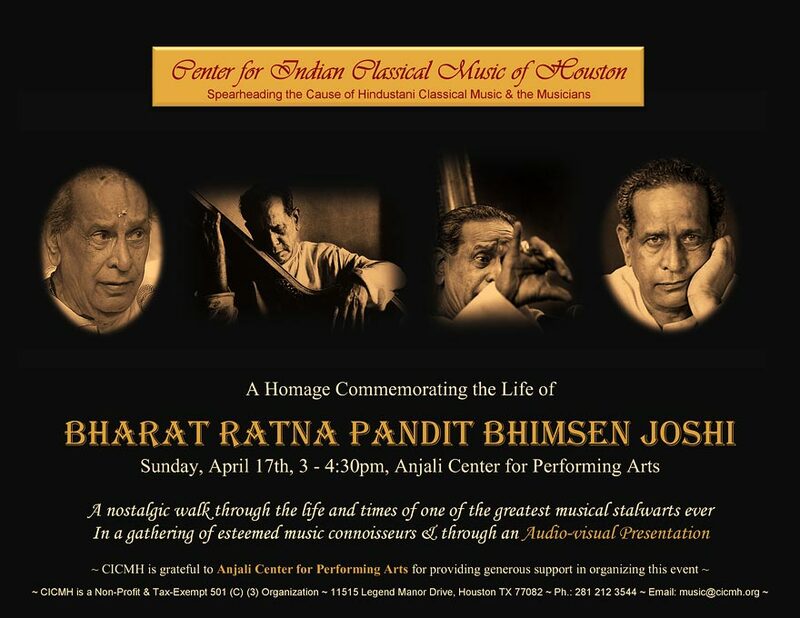 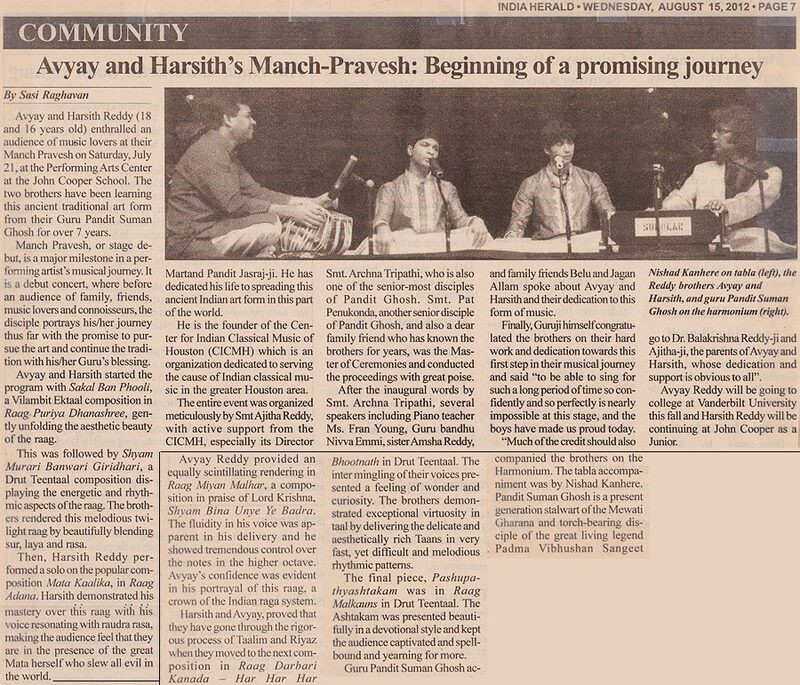 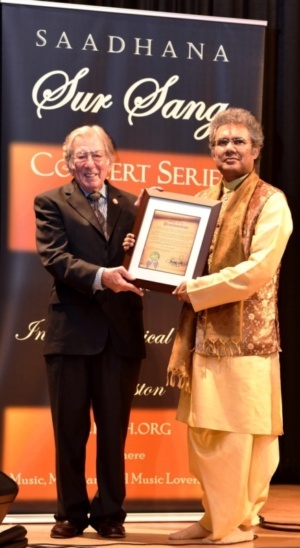 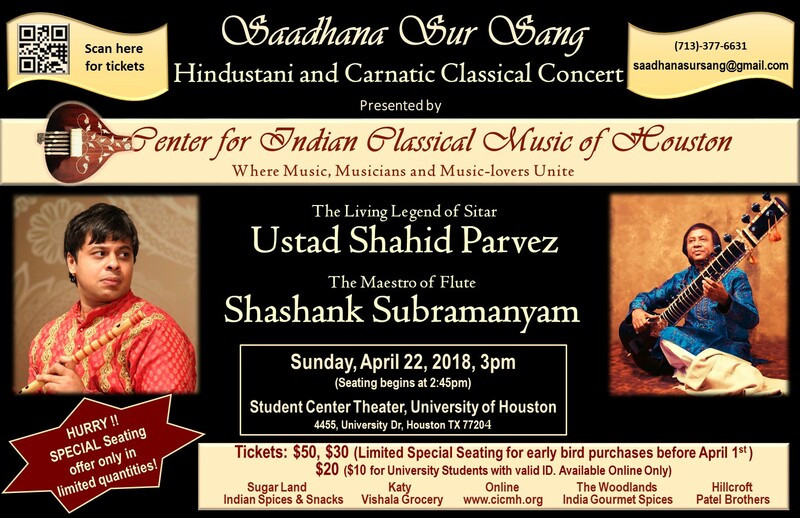 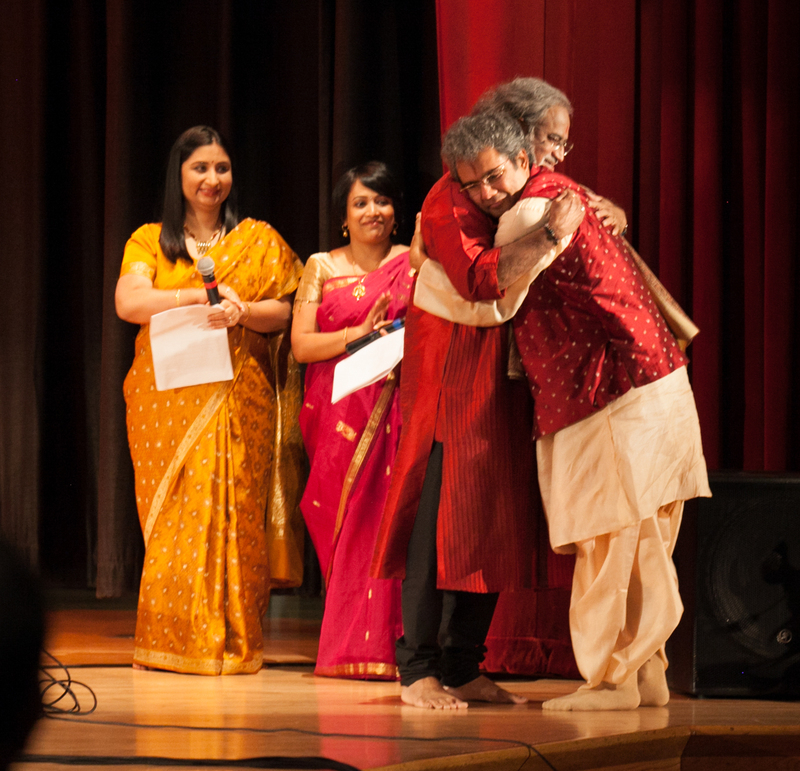 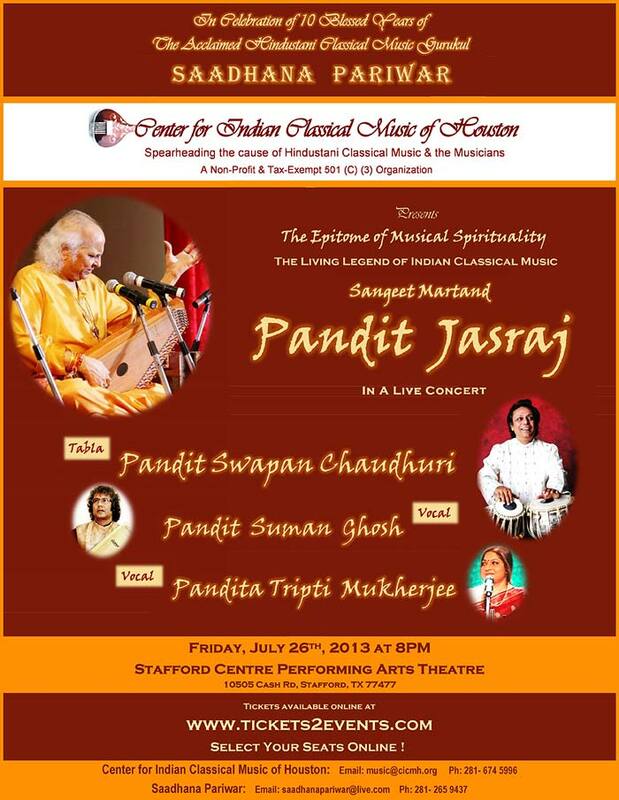 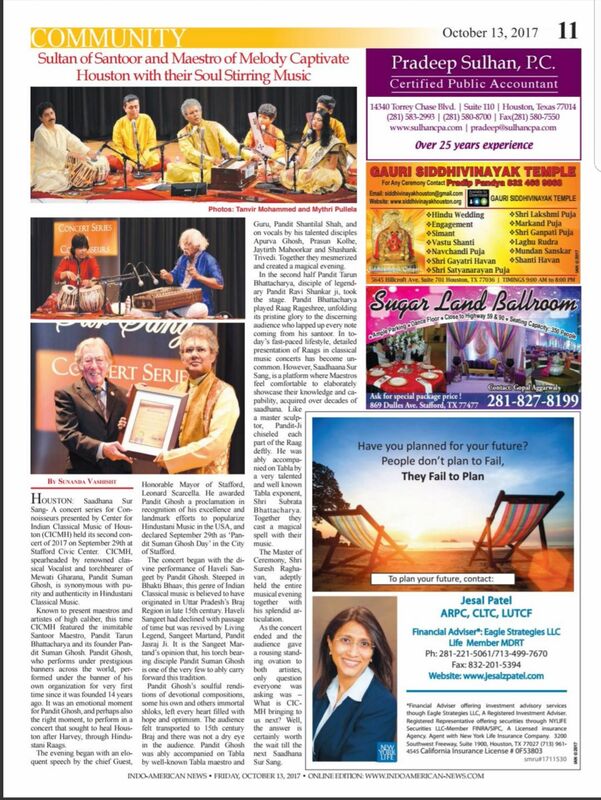 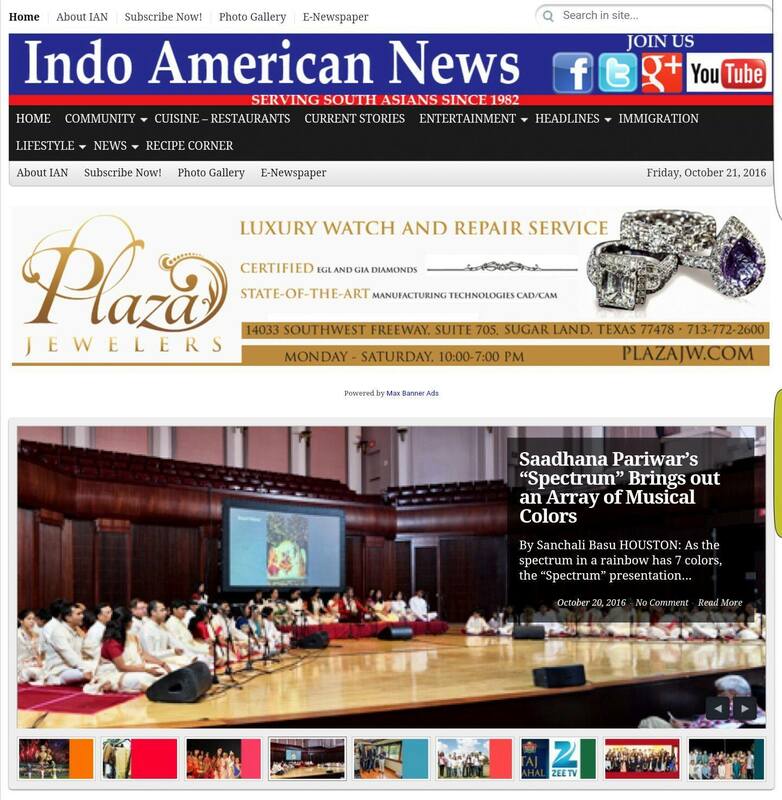 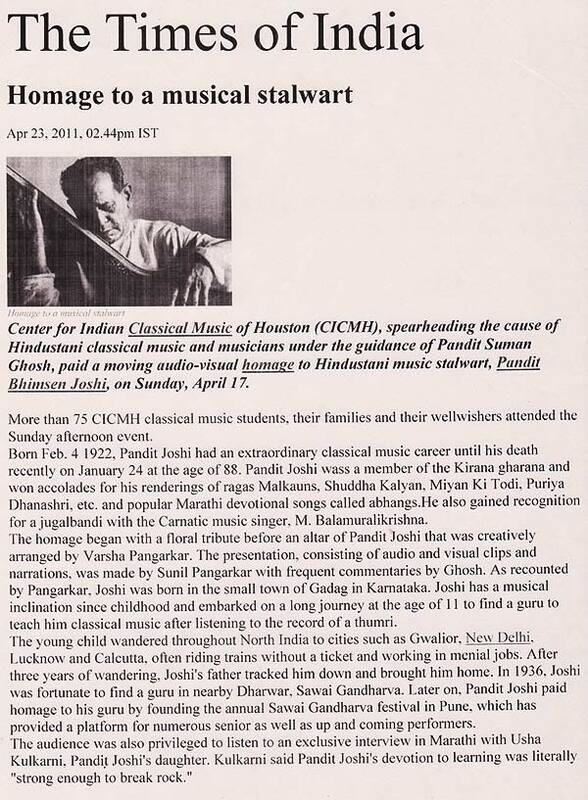 Endowed with this clarity of vision, The Center for Indian Classical Music (CICMH) sees itself contributing very definitely and concretely to peace and harmony in the world by transcending all man-made barriers and weaving together the peoples of this world with the purity of seven notes. 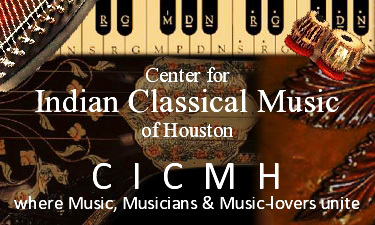 CICMH began working towards this goal long before its official establishment in 2008. 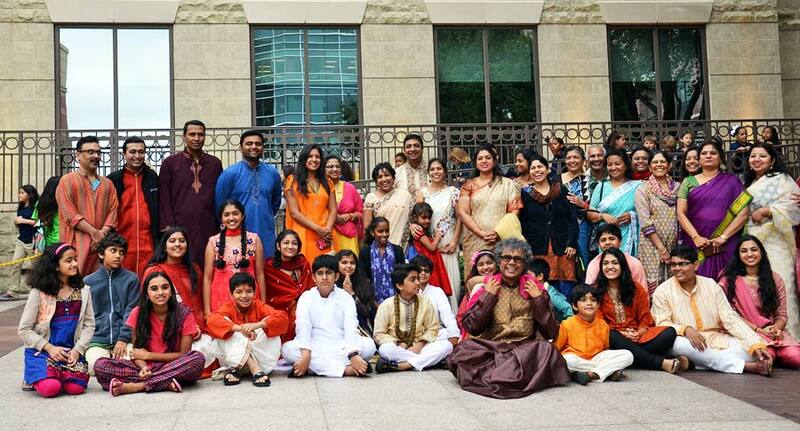 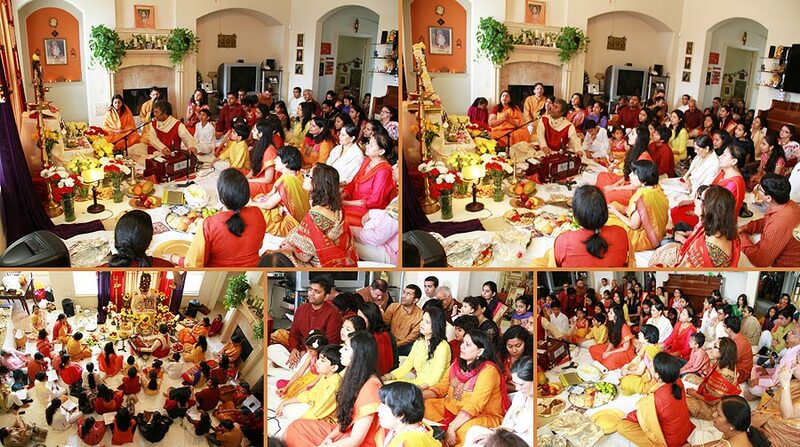 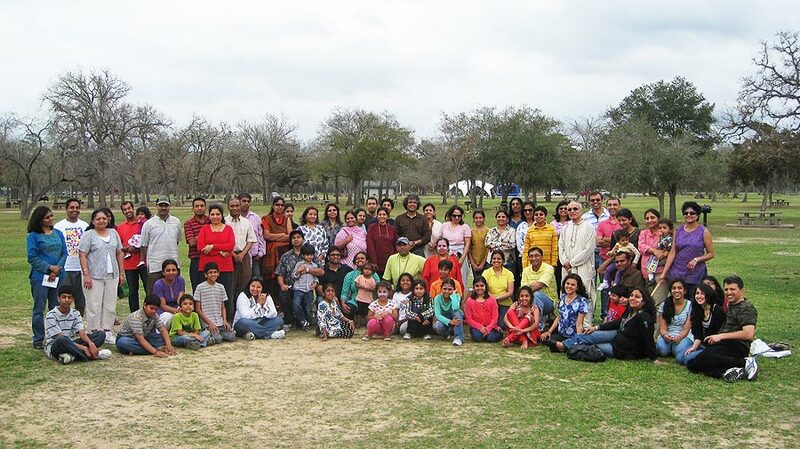 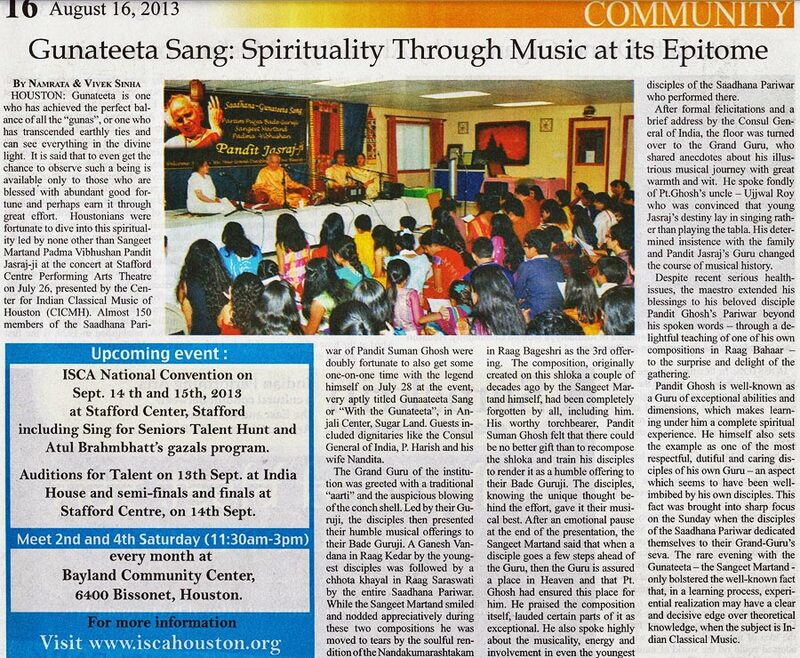 By virtue of its founder’s creative ideas and concepts, and the exceptional commitment and dedication of his beloved disciples and their families, Houston and the surrounding areas have seen many conceptually novel events in this field. 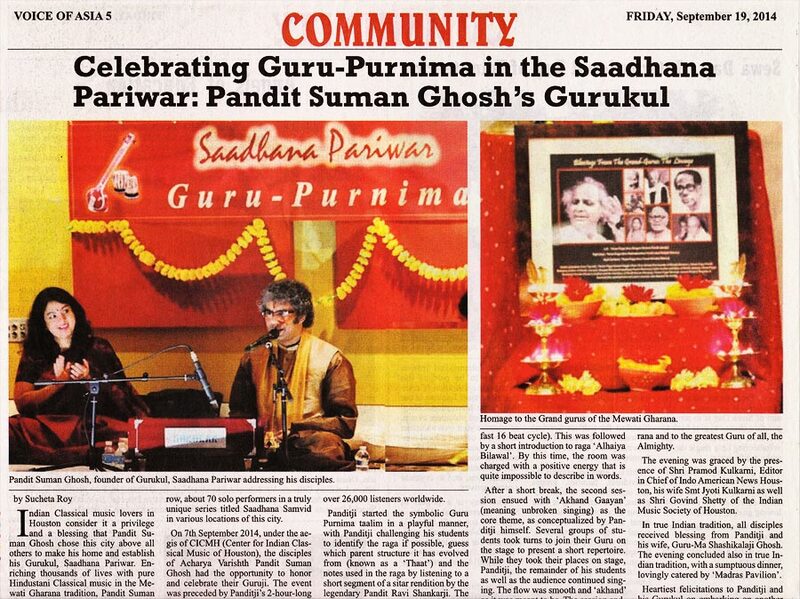 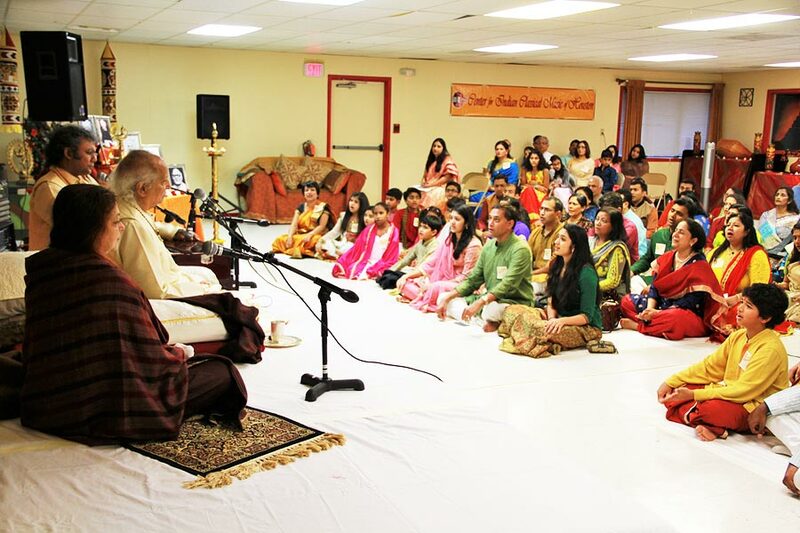 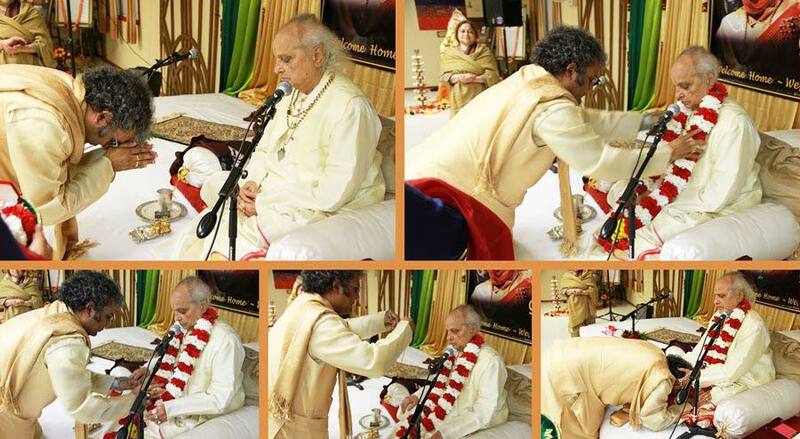 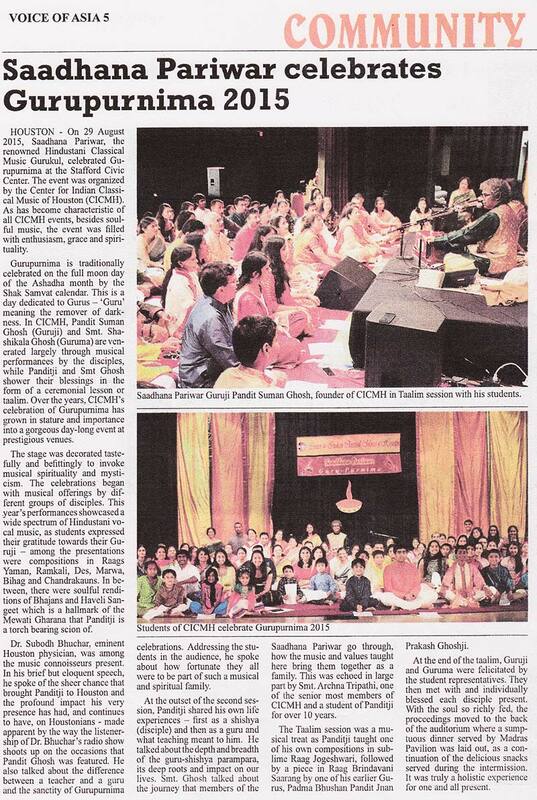 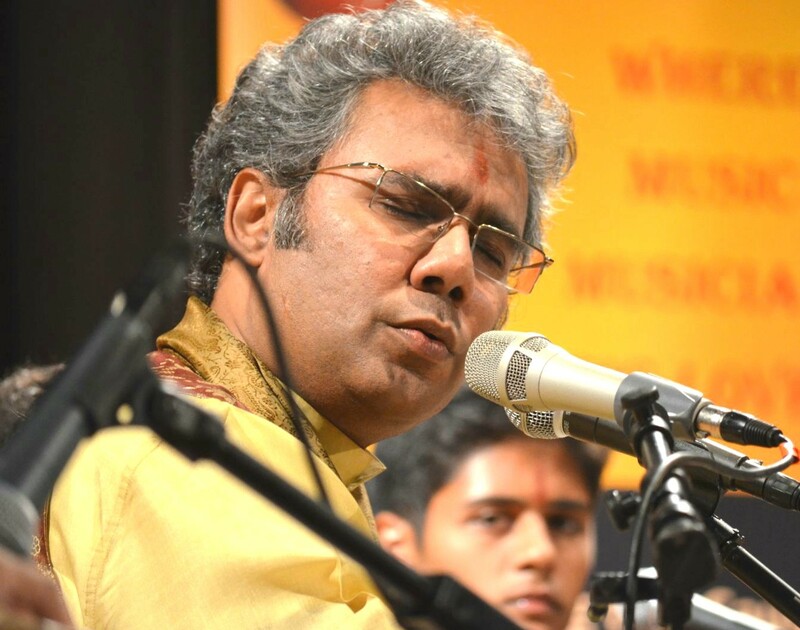 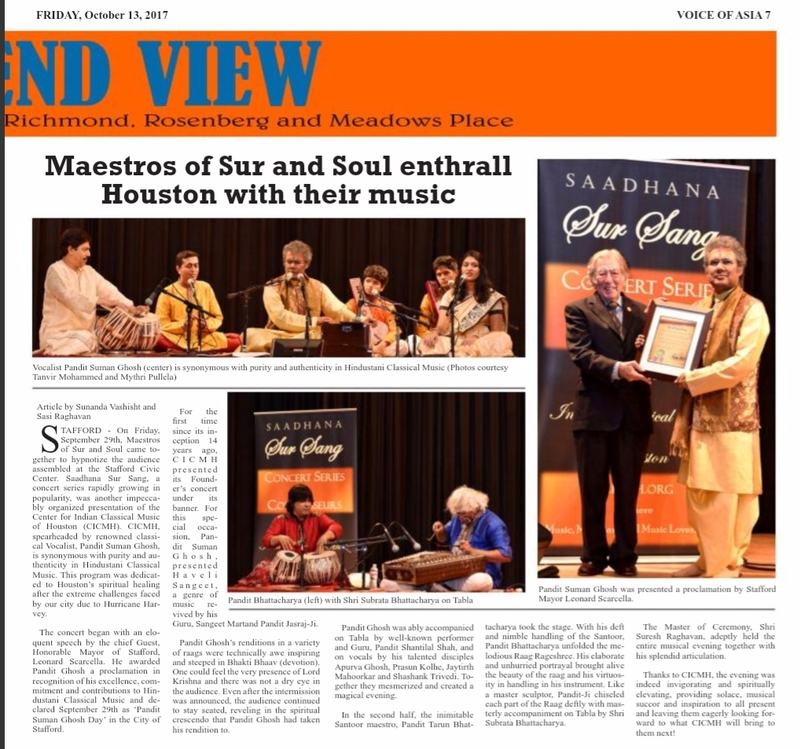 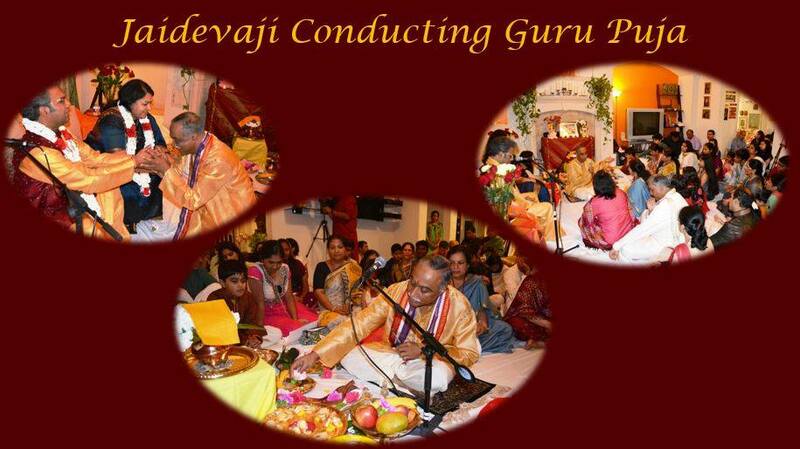 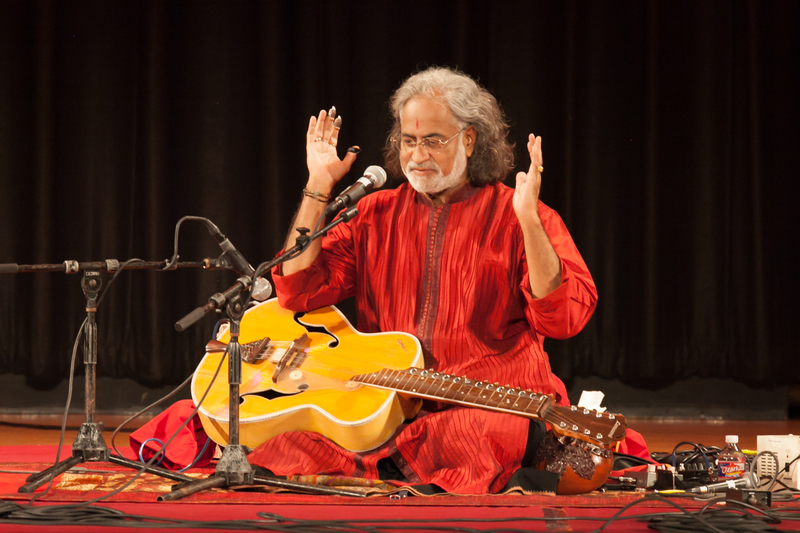 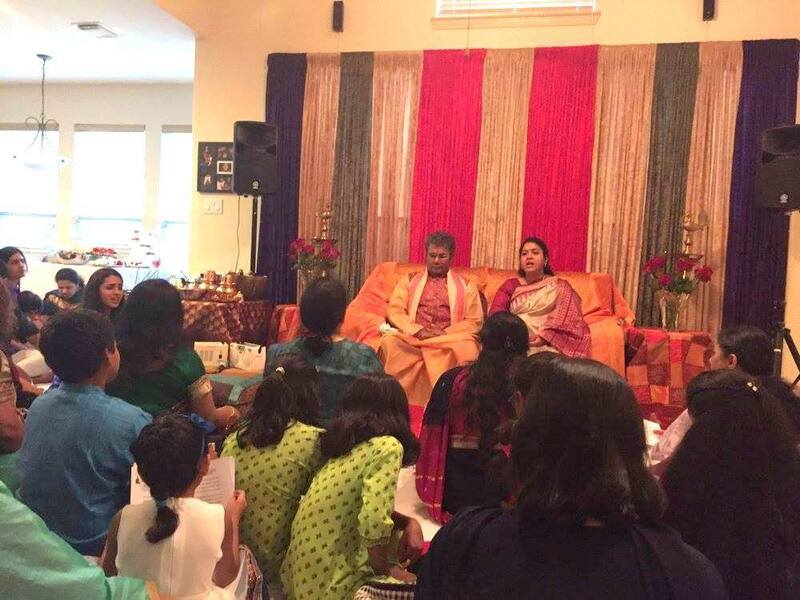 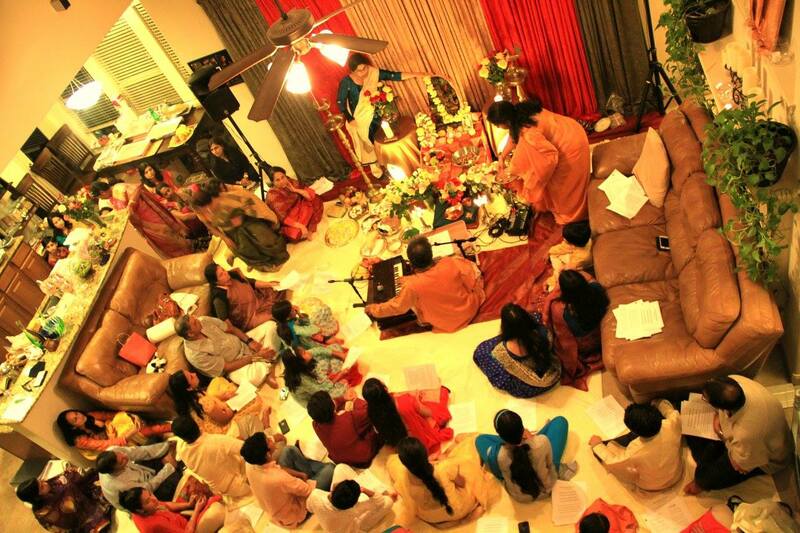 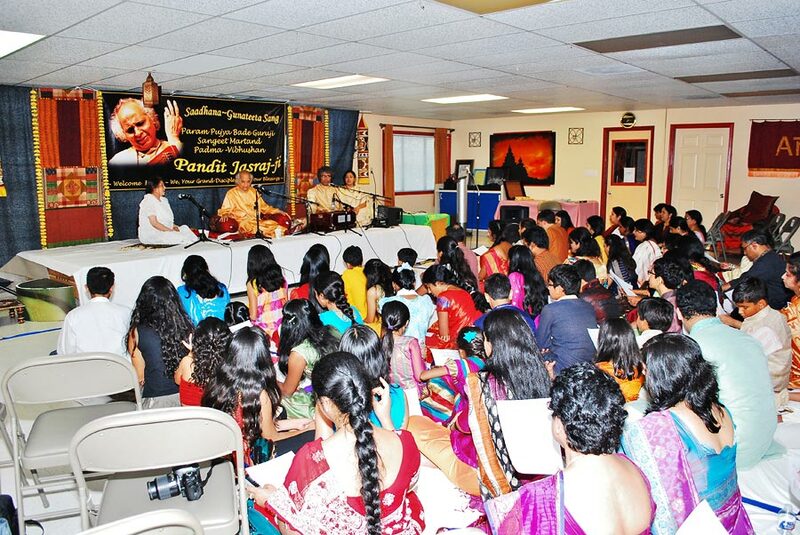 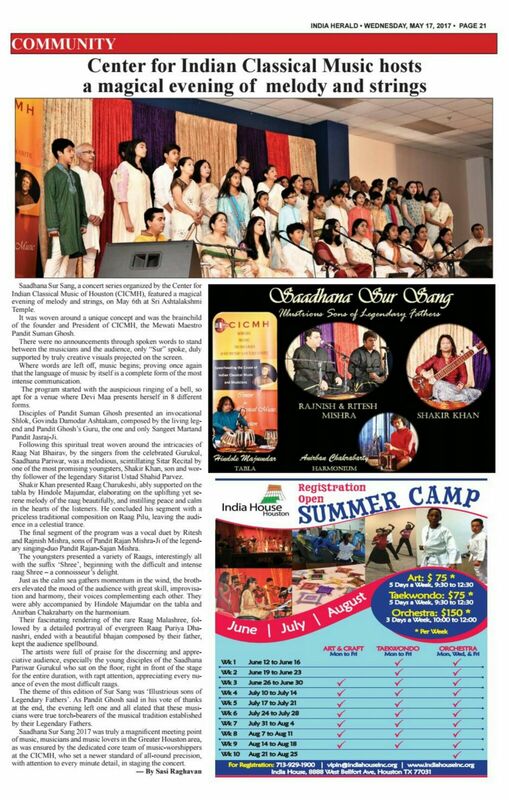 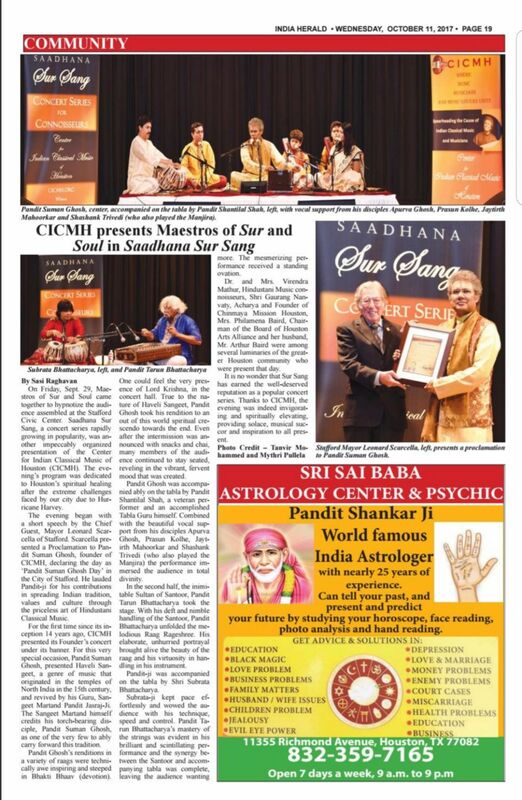 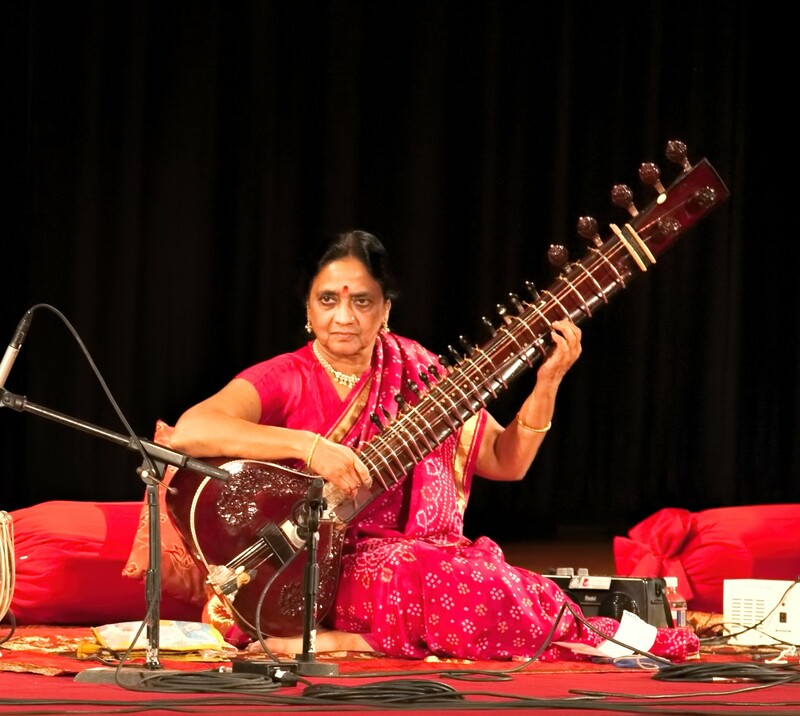 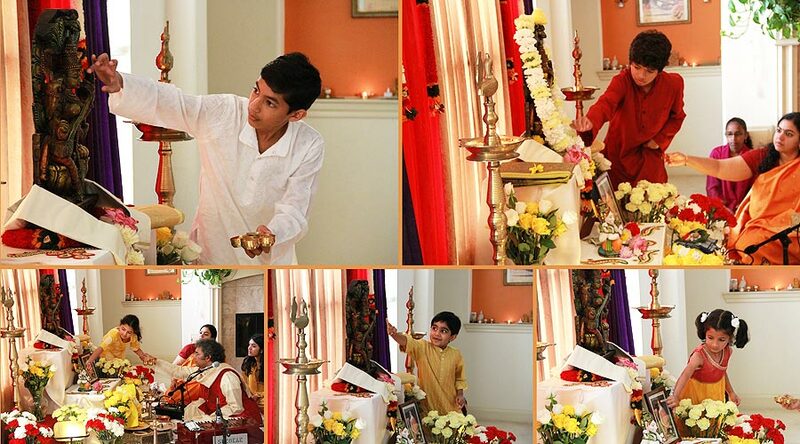 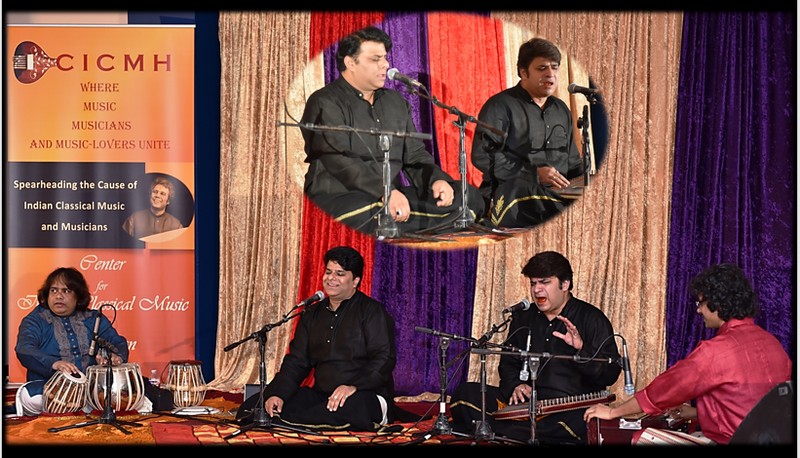 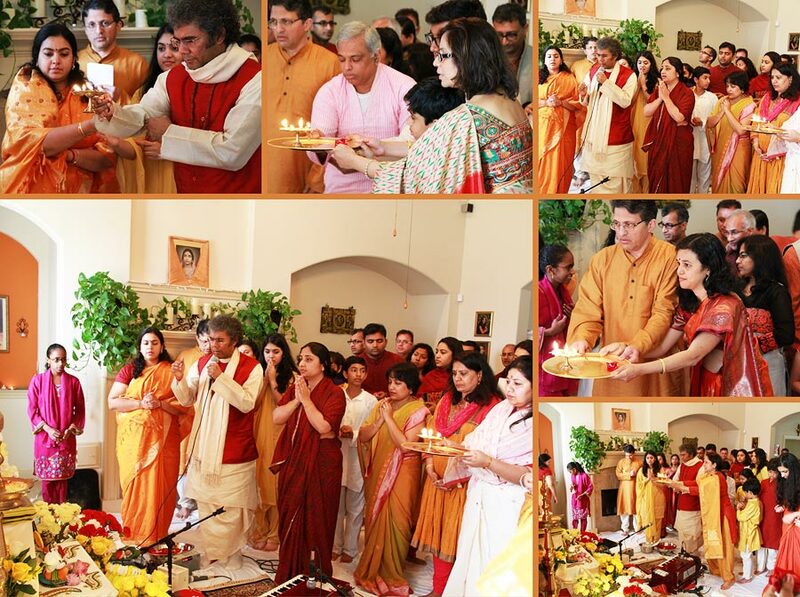 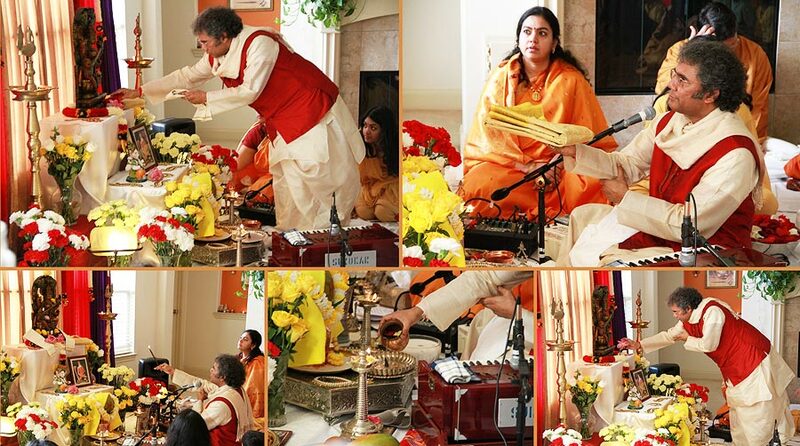 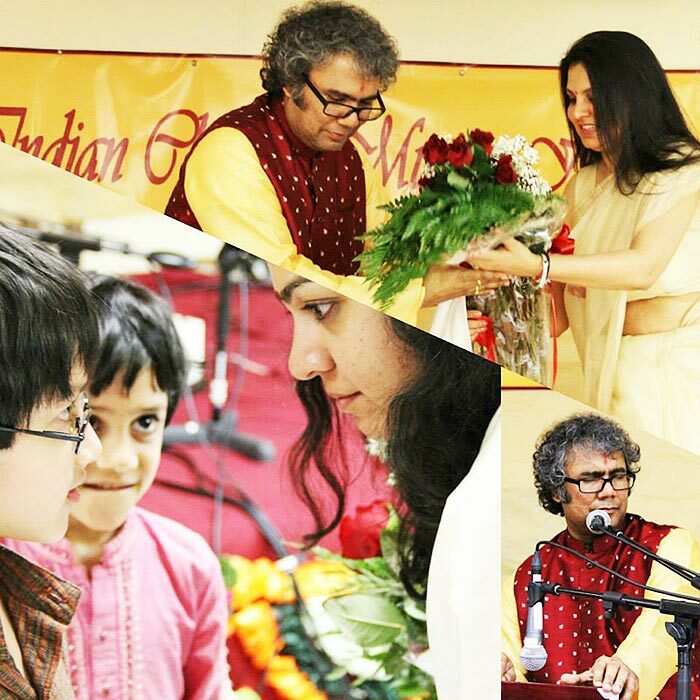 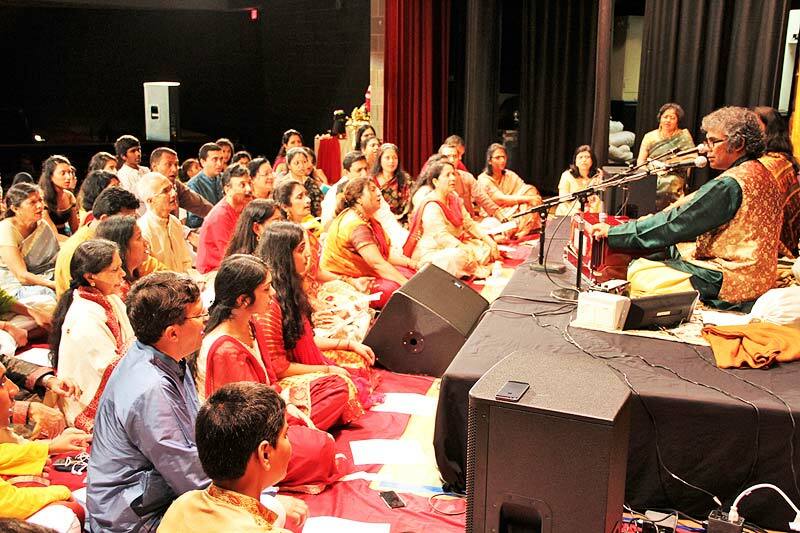 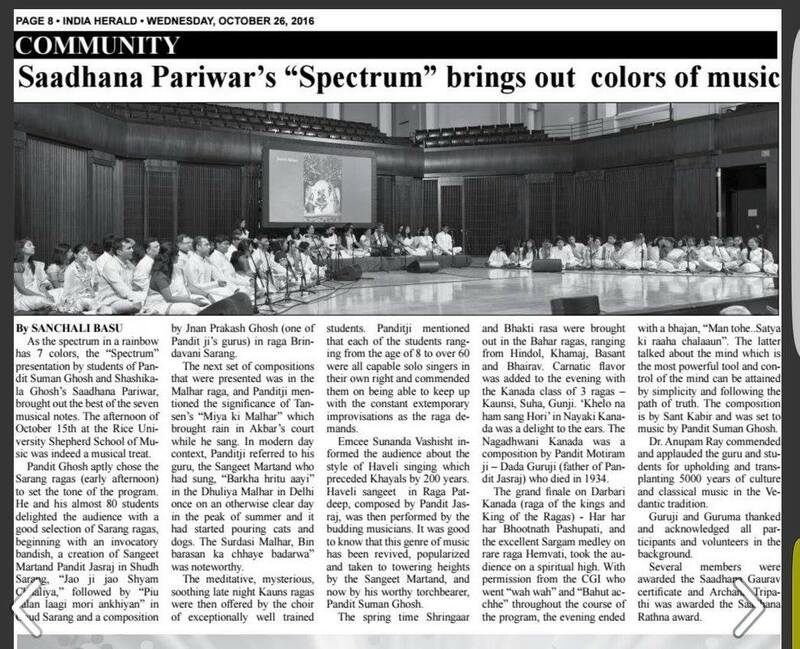 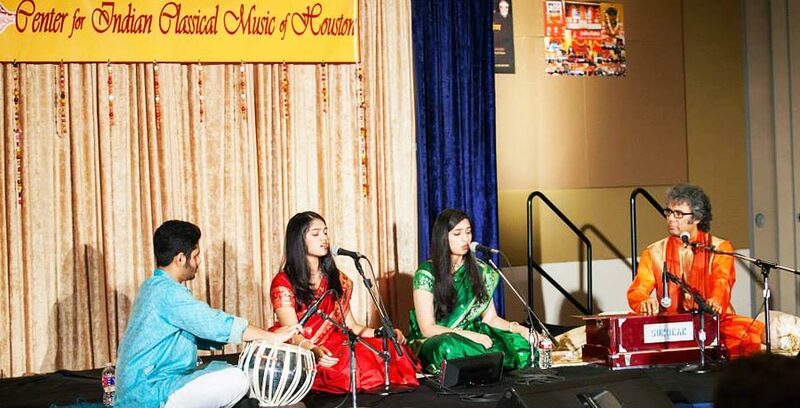 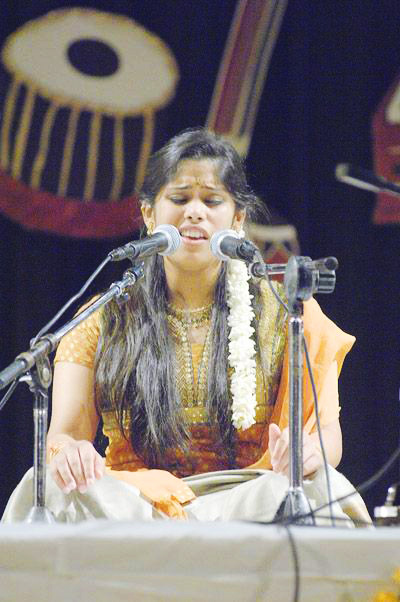 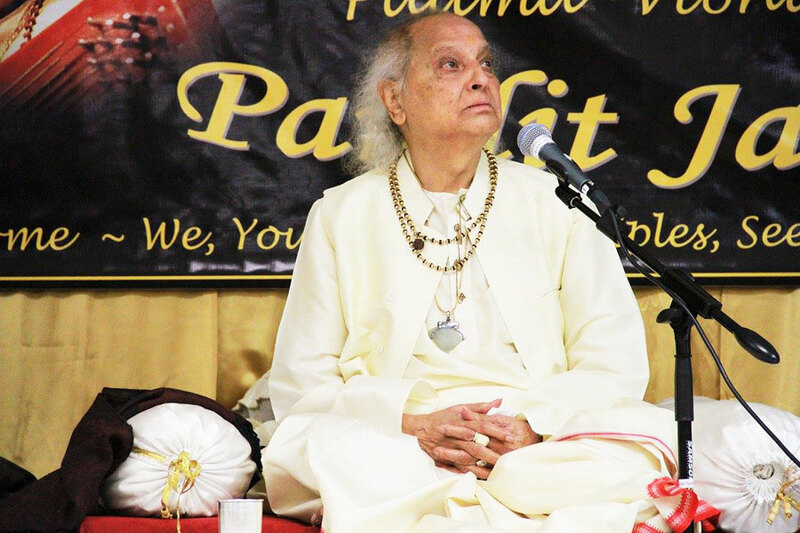 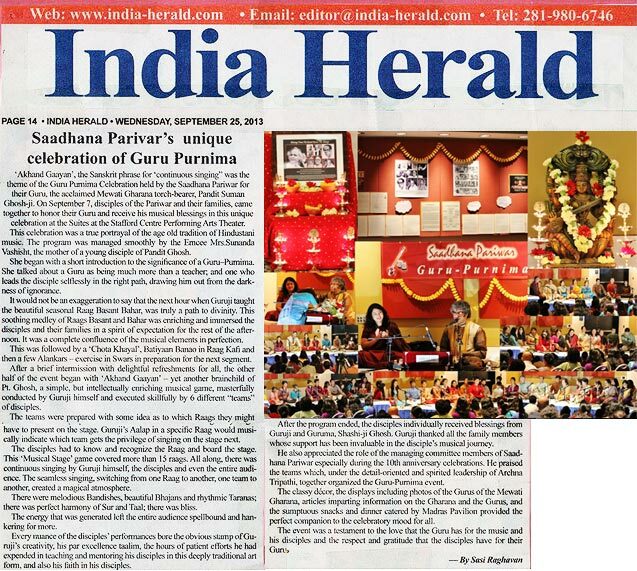 Saadhana Pariwar, the Gurukul of CICMH offers music learners the unique and extra ordinary opportunity to learn directly from a Maestro and one of the most revered Gurus in the field – experiencing pearls of his musical wisdom, knowledge and mastery. 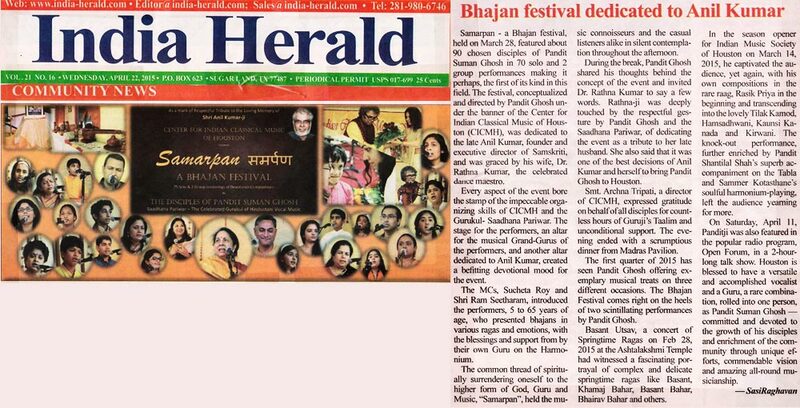 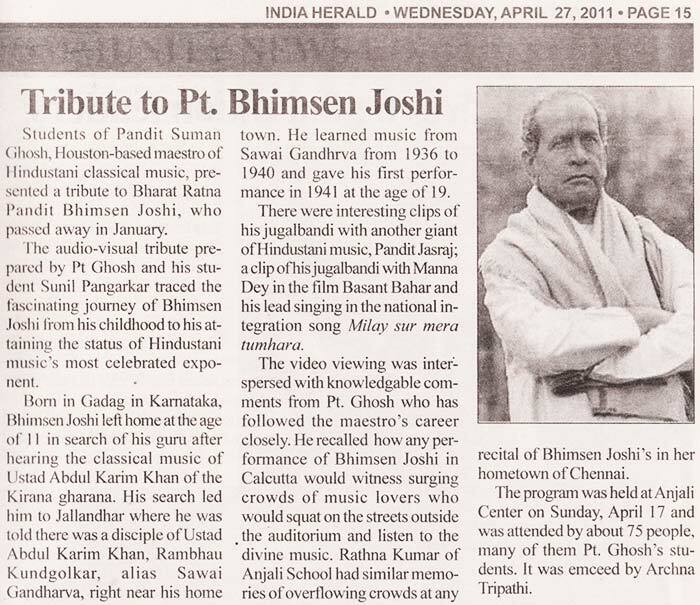 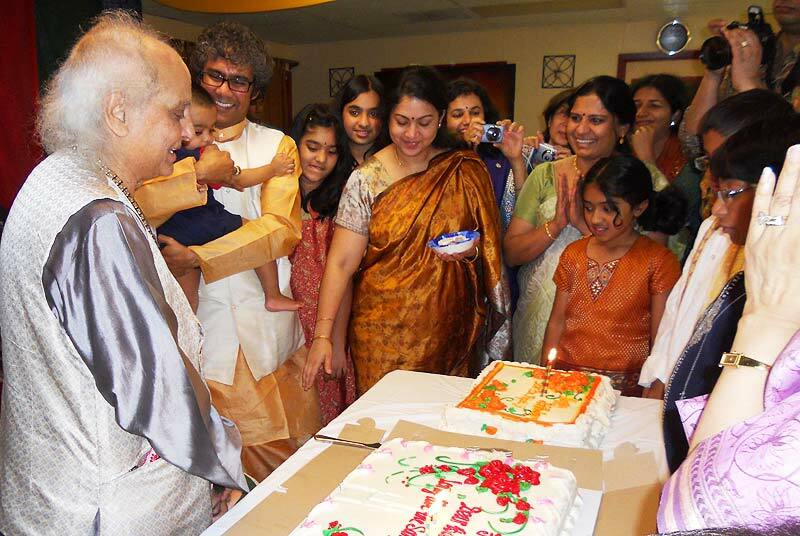 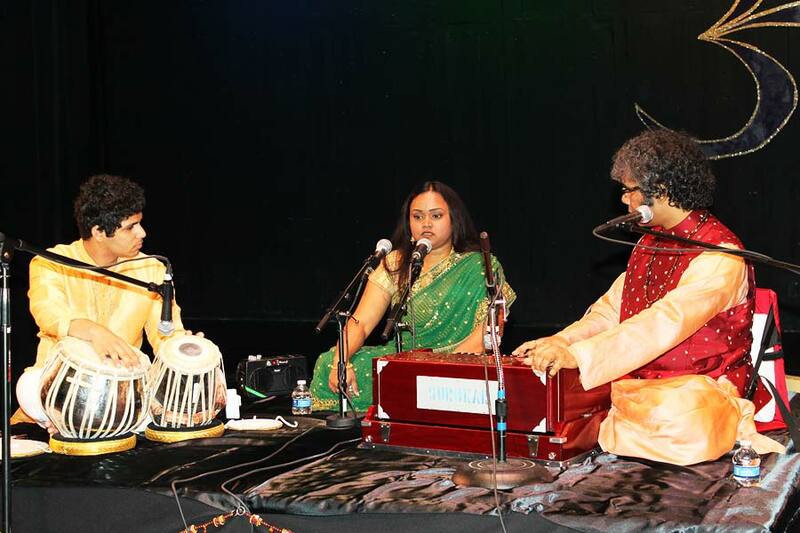 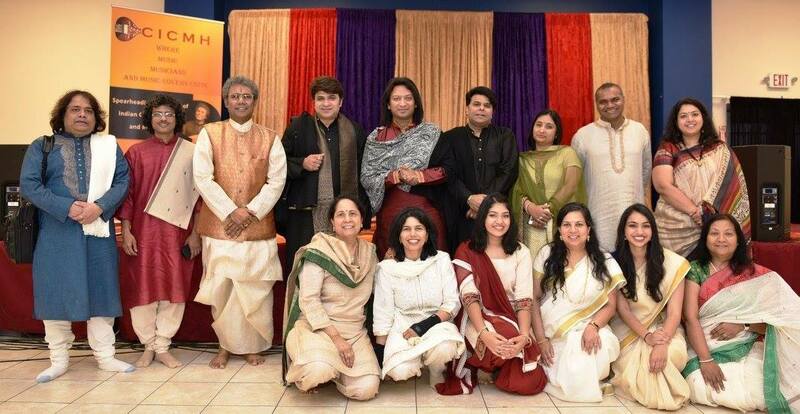 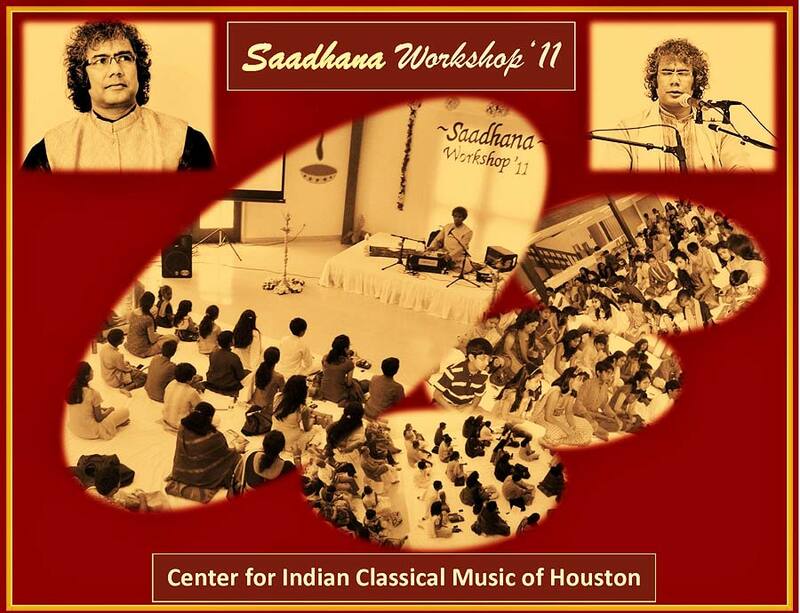 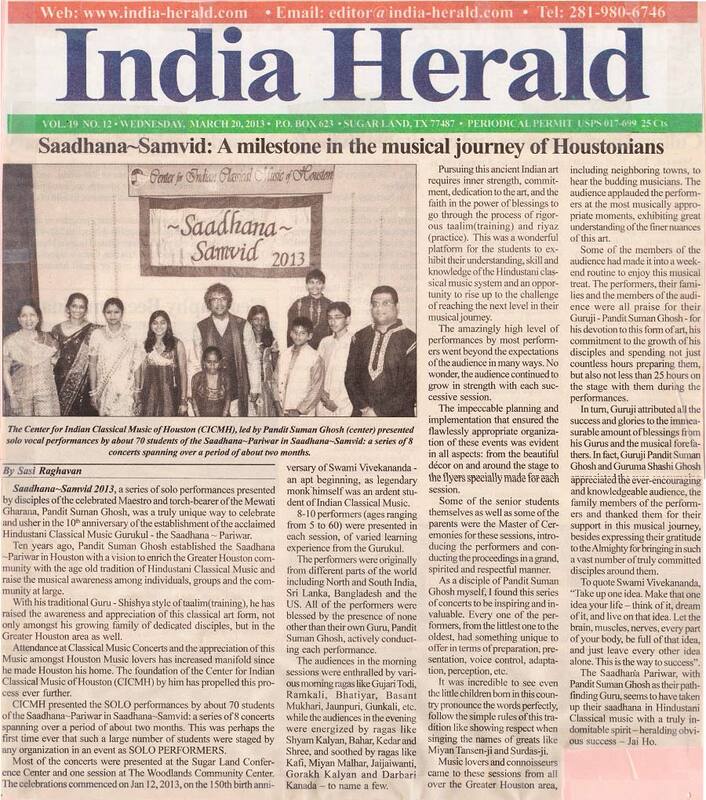 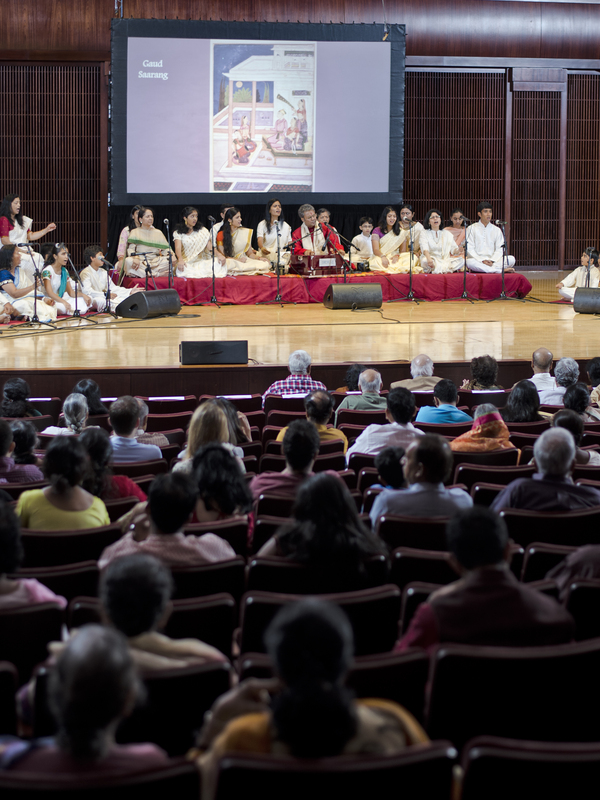 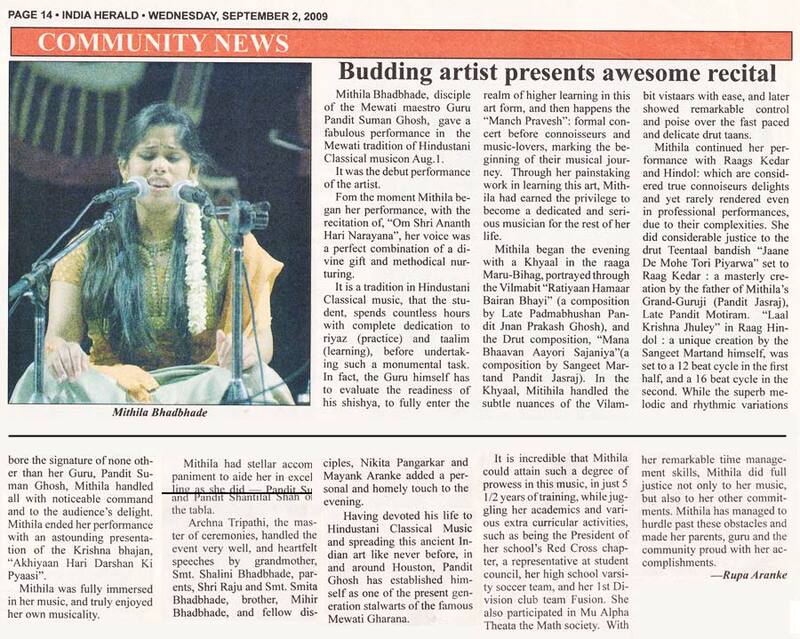 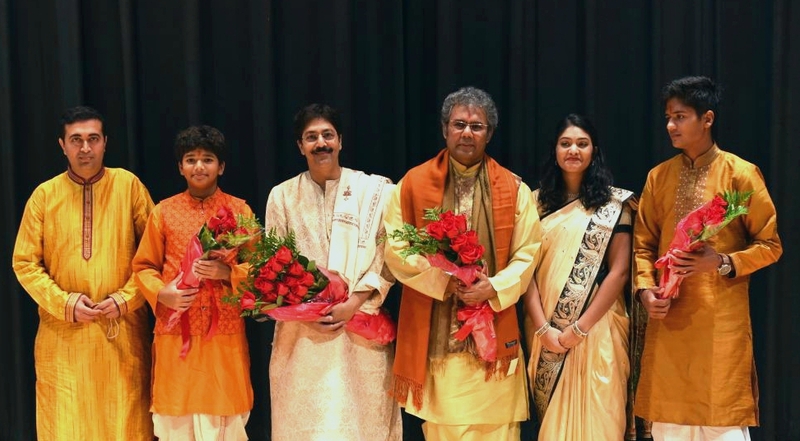 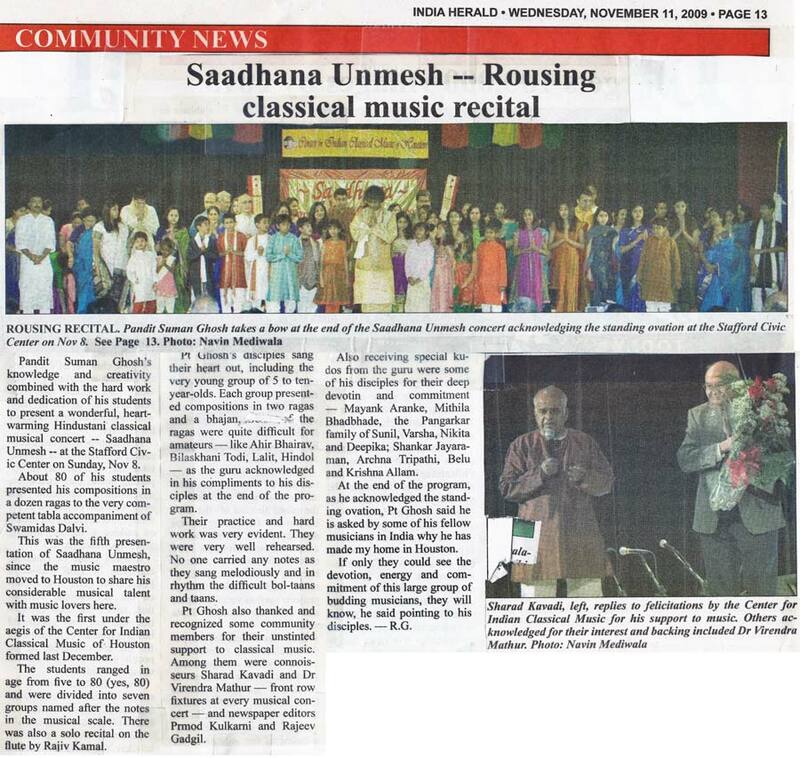 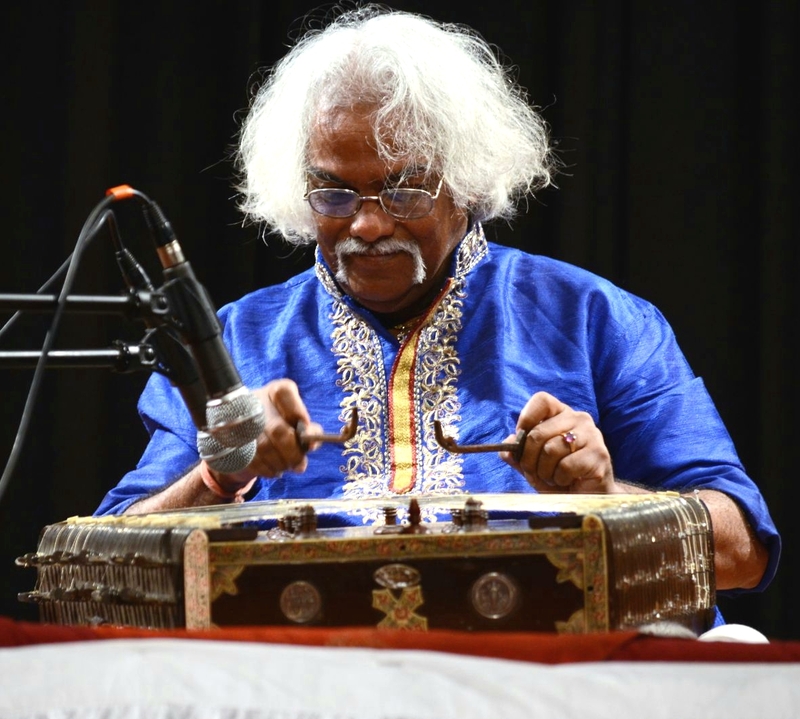 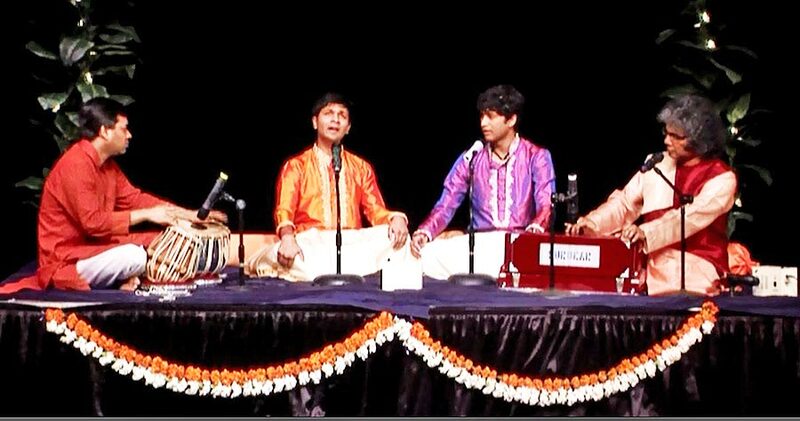 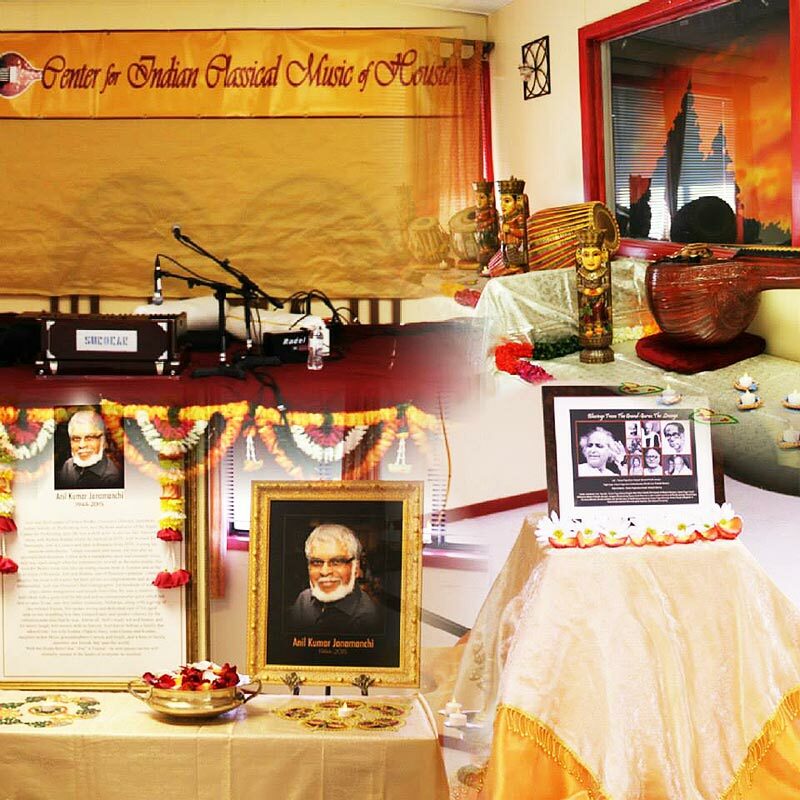 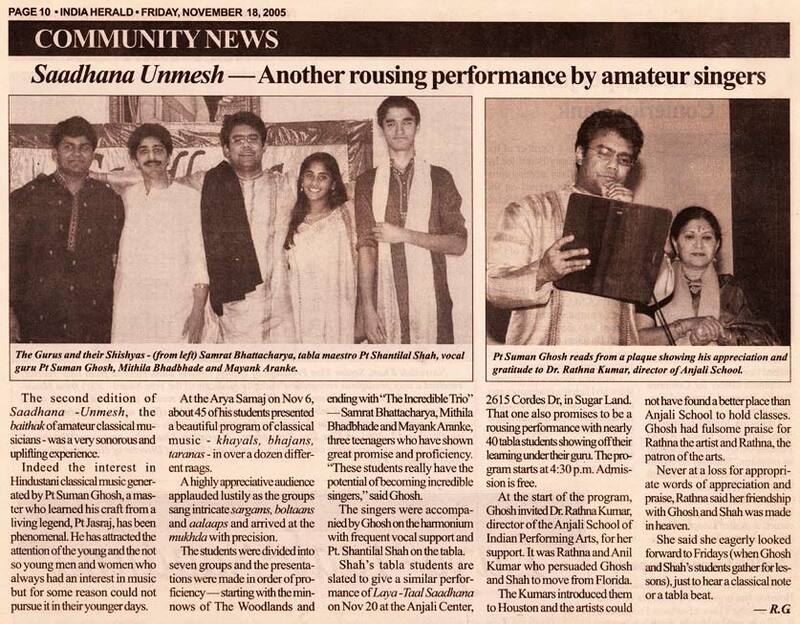 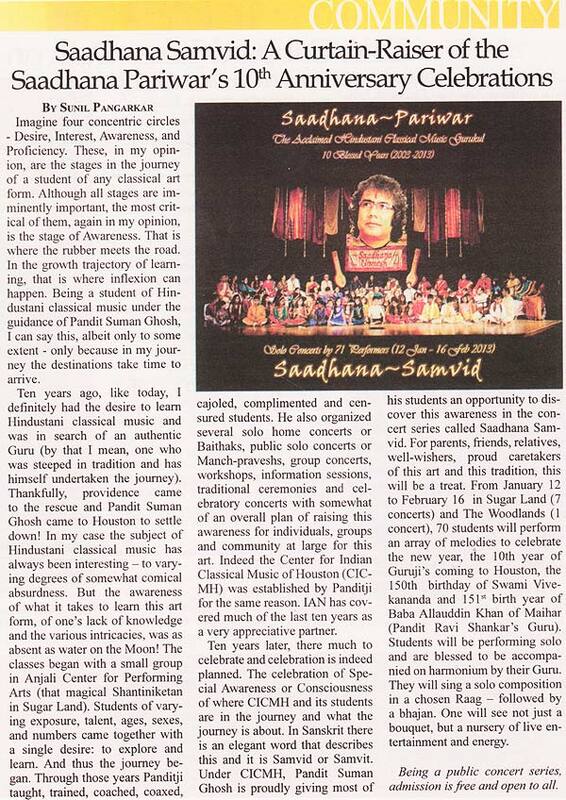 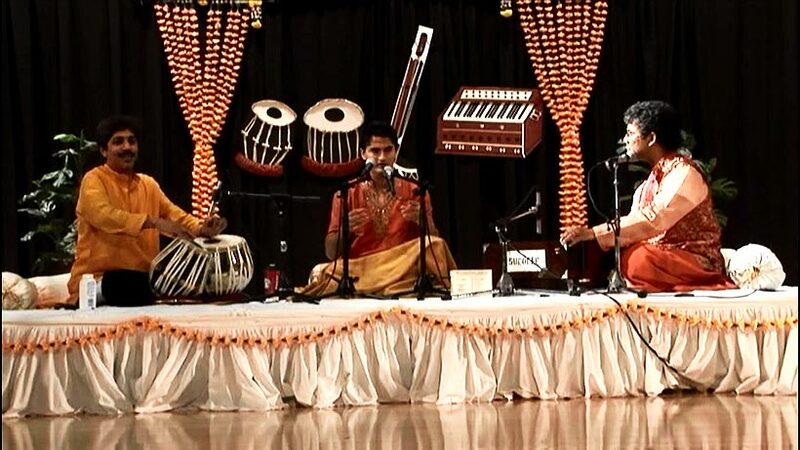 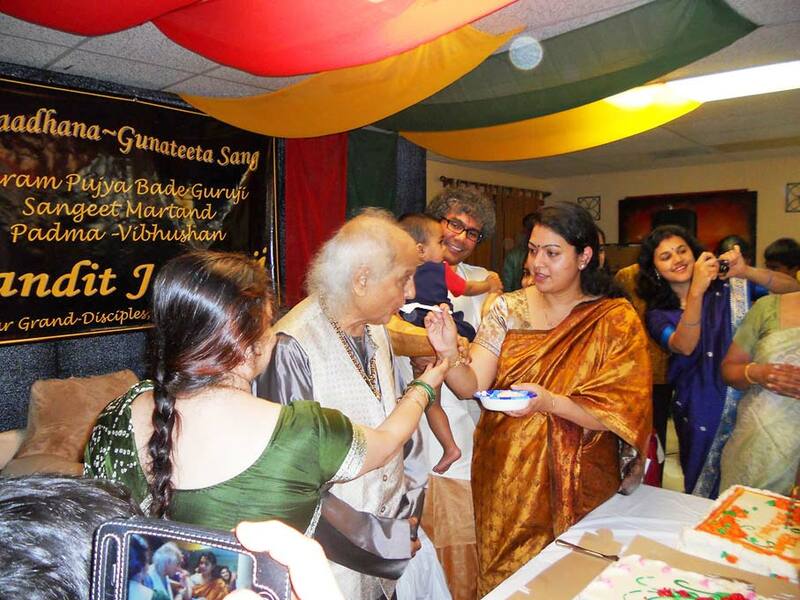 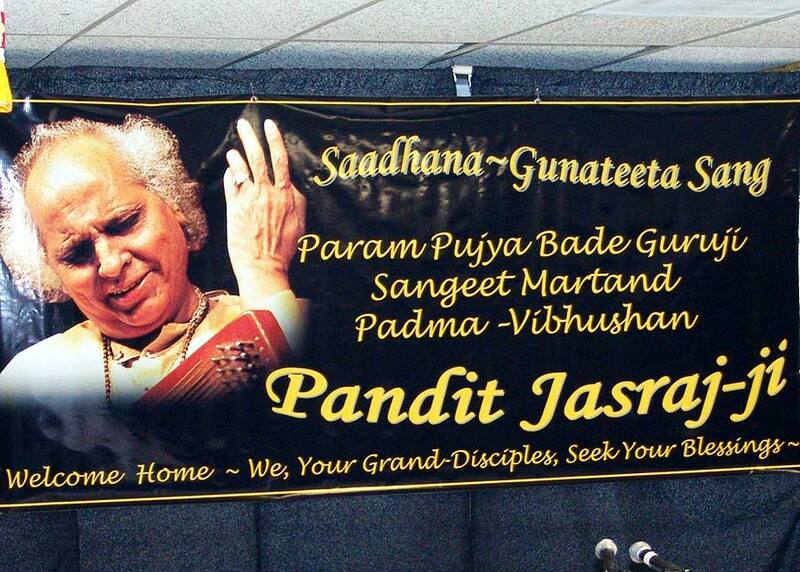 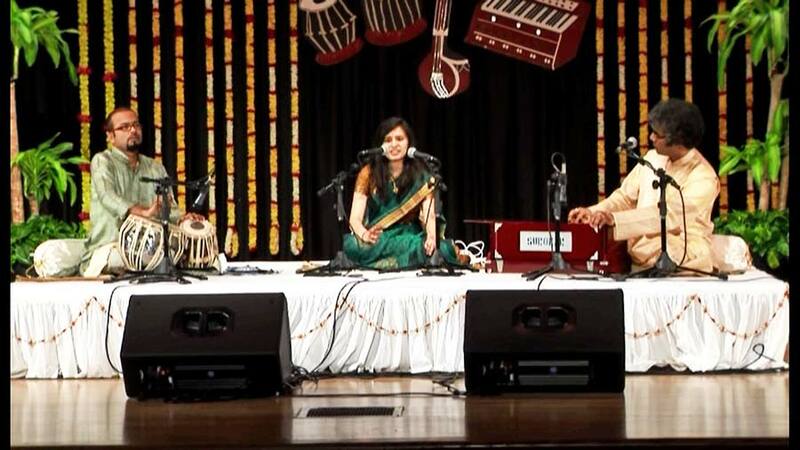 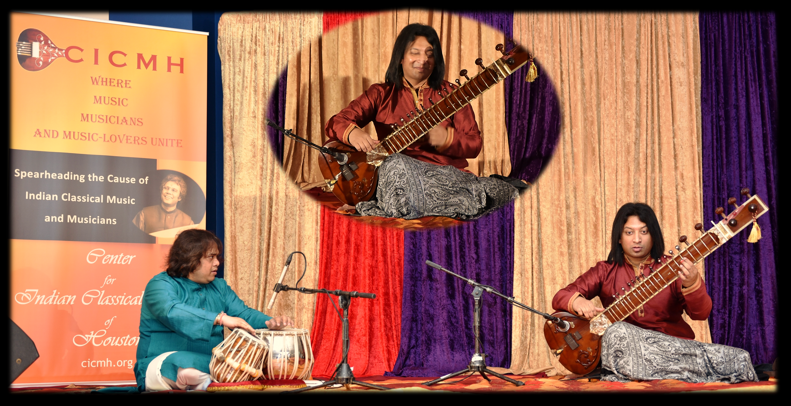 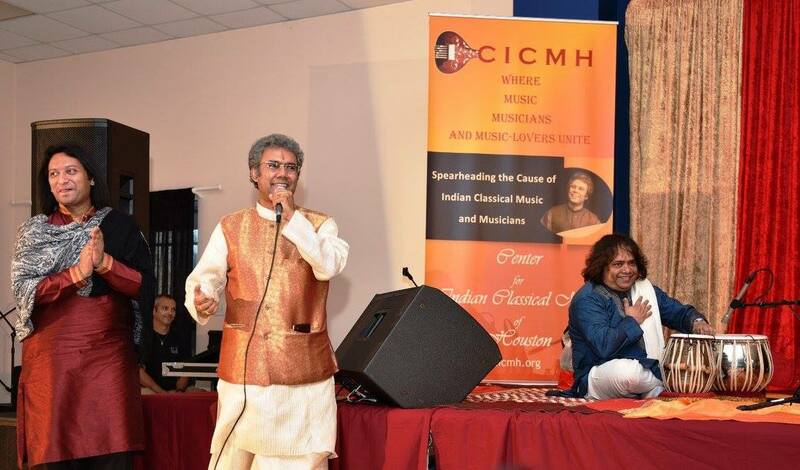 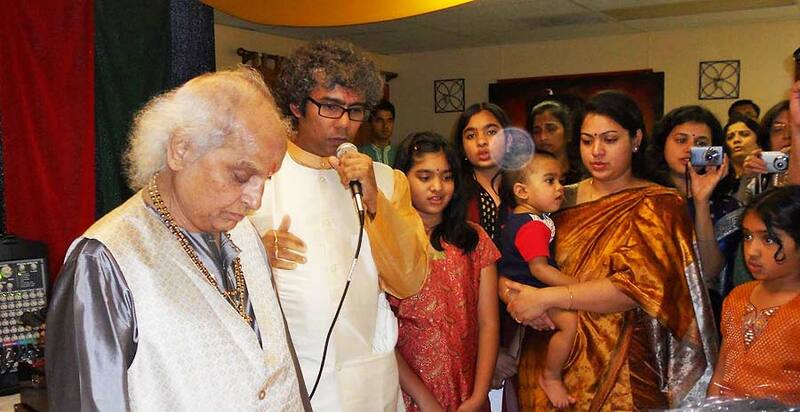 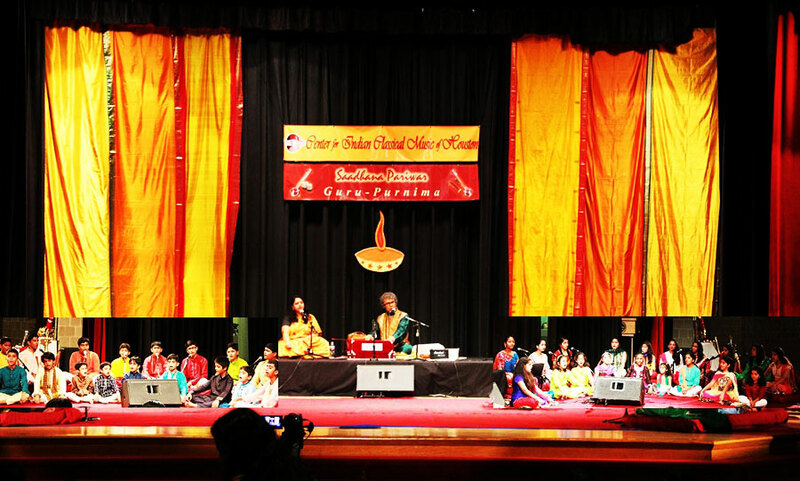 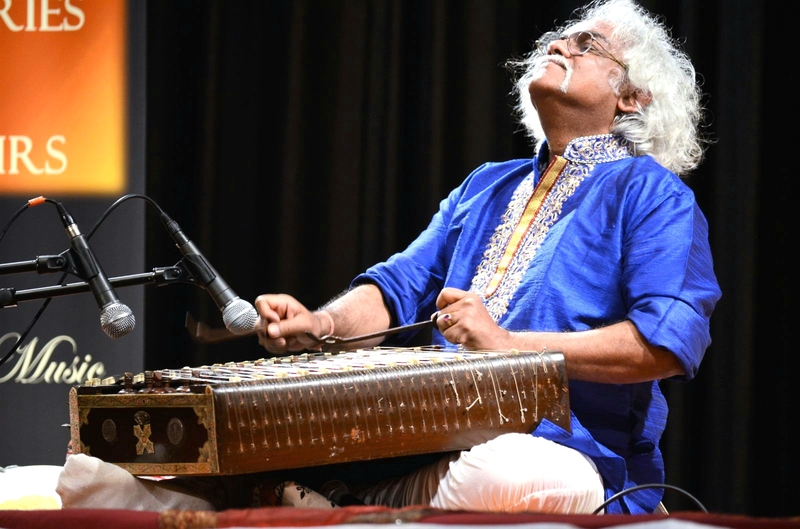 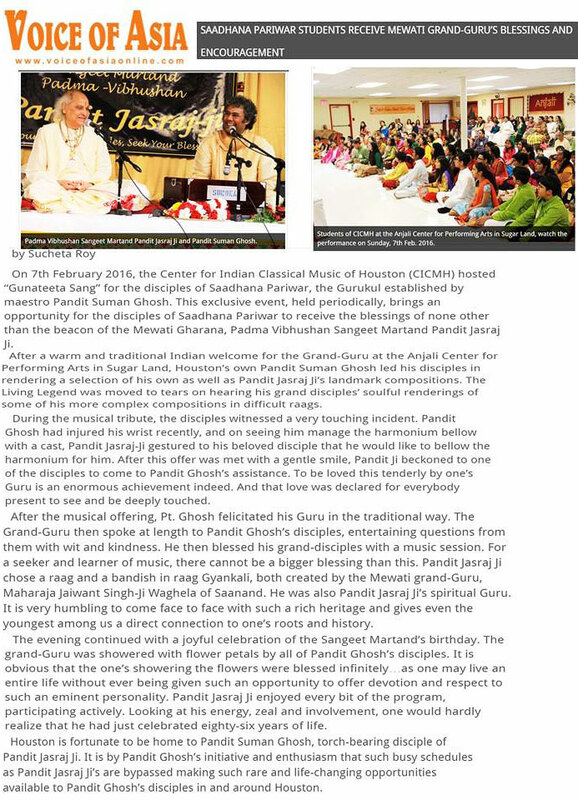 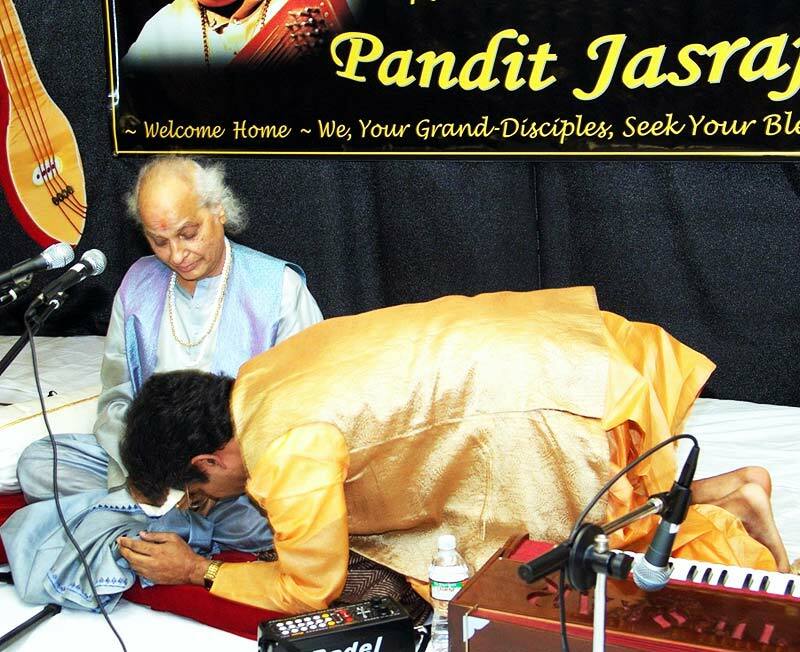 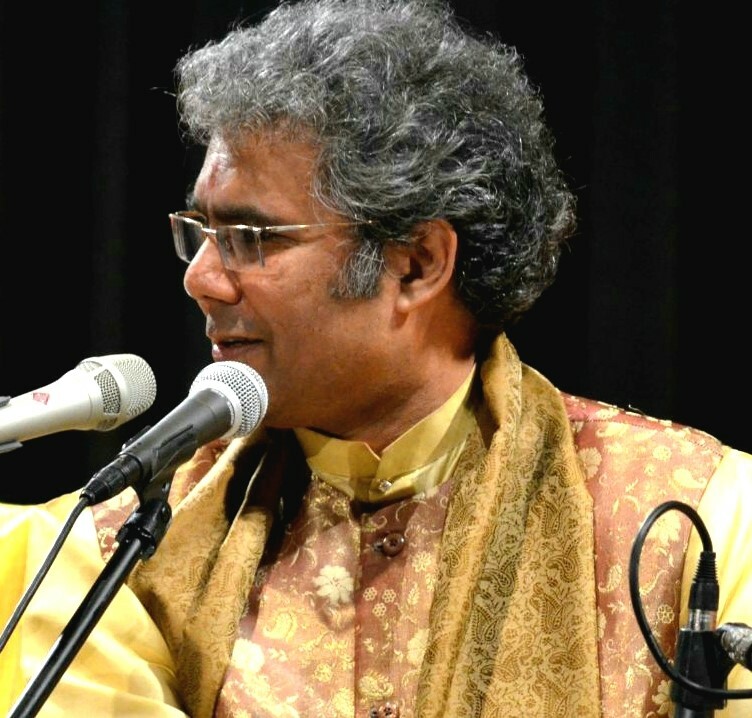 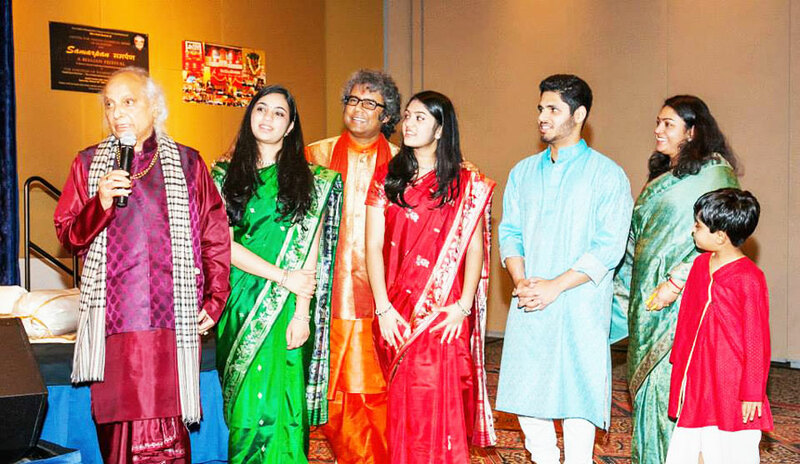 As part of Pandit Ghosh’s relentless efforts to take his disciples to newer musical heights, CICMH provides them with various unique platforms to showcase the results of their Saadhana under his tutelage. 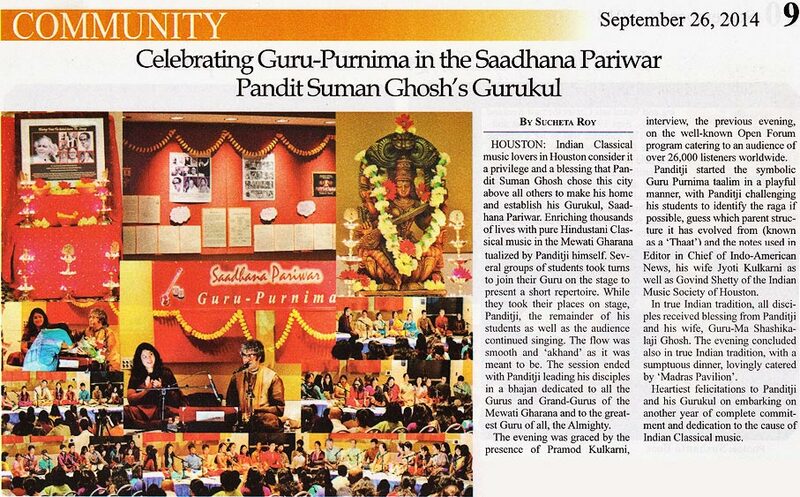 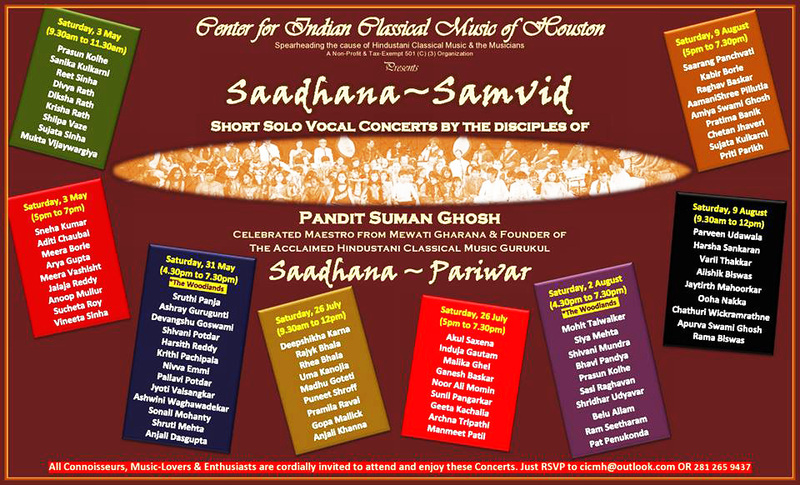 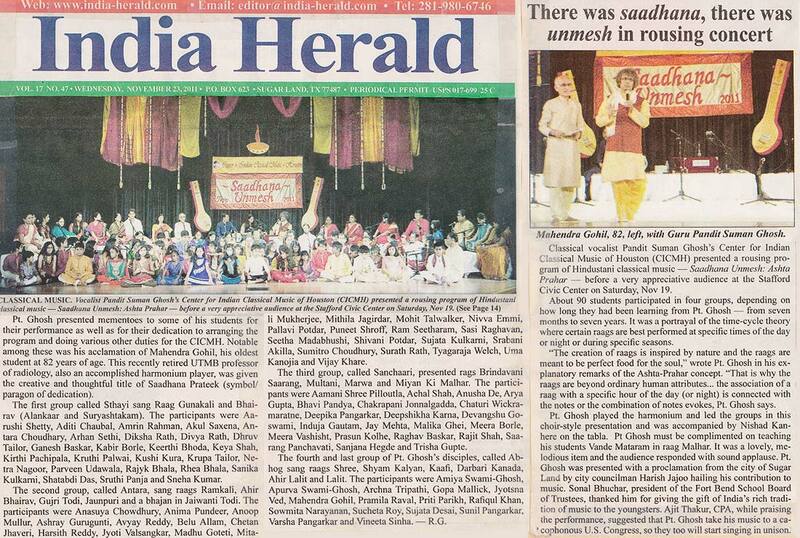 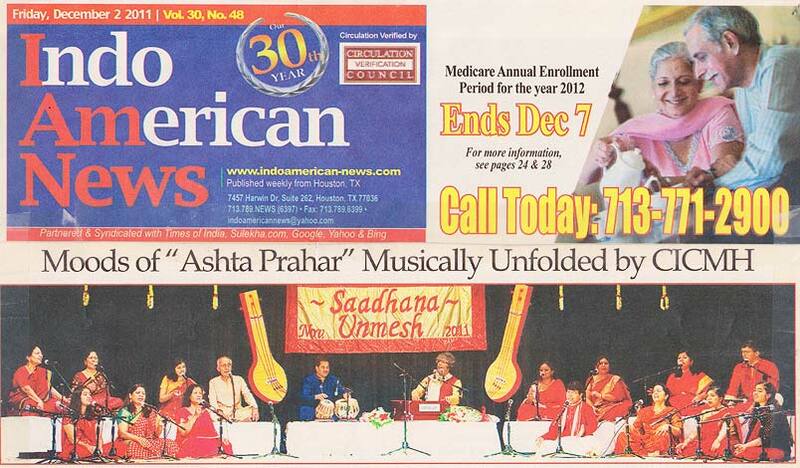 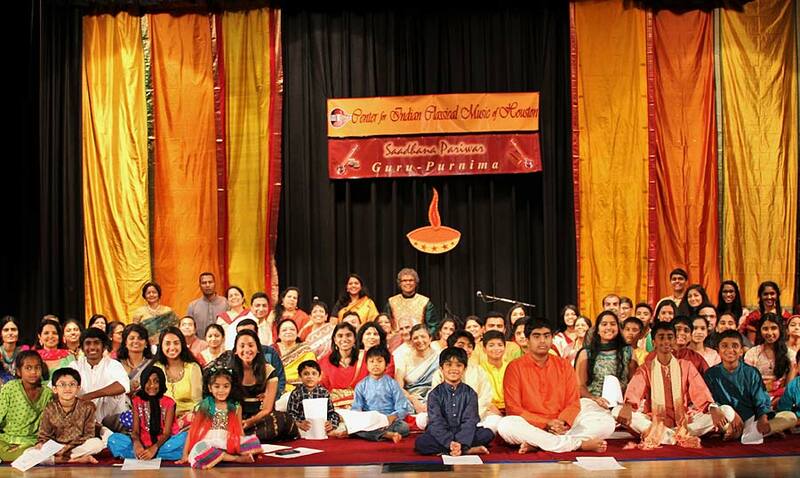 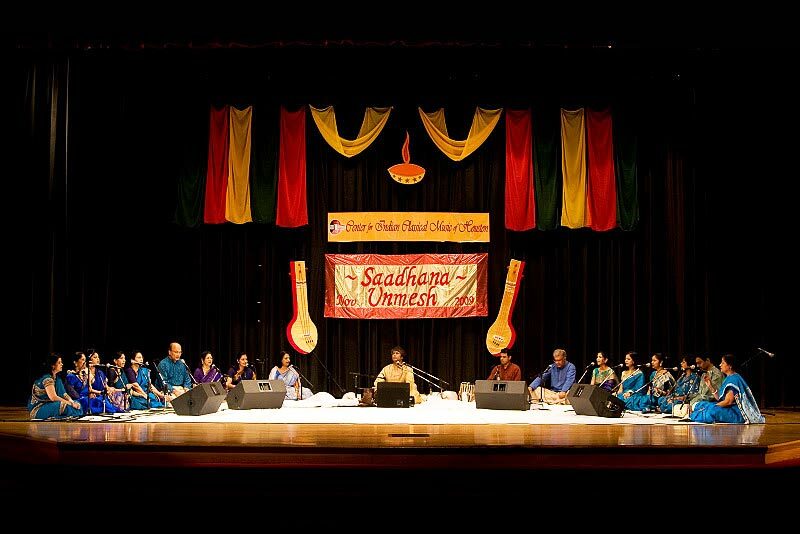 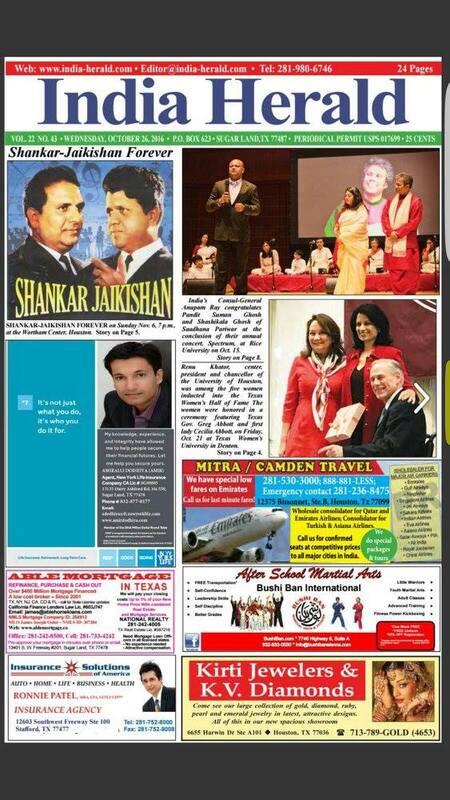 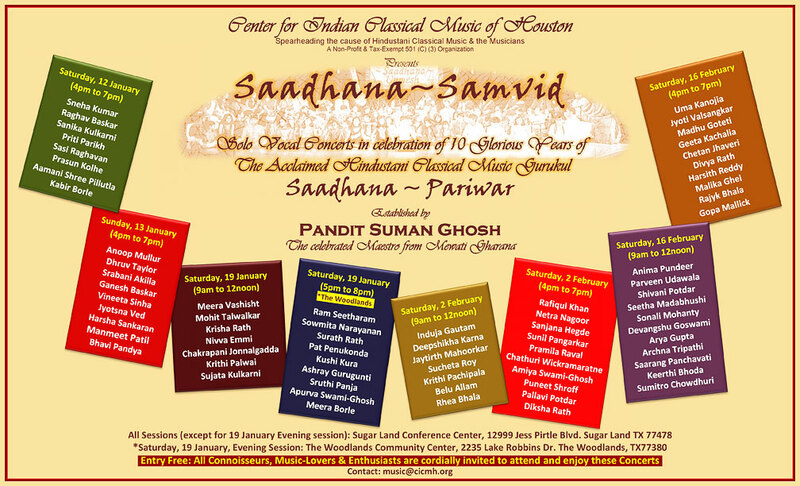 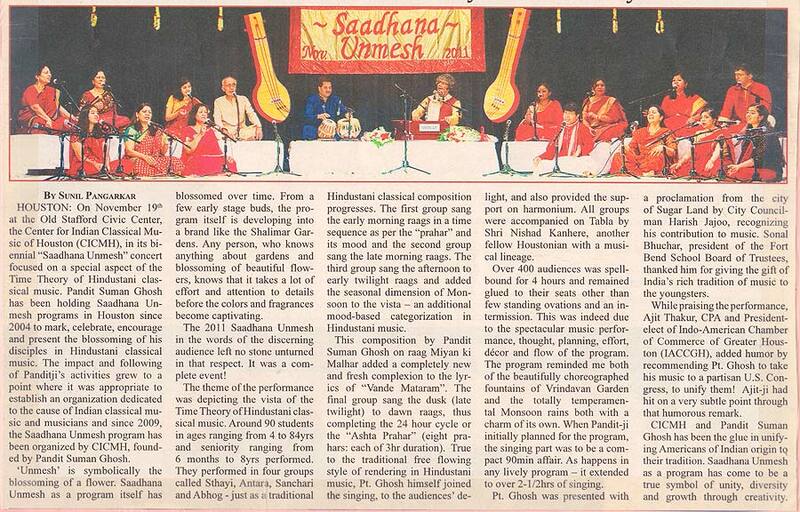 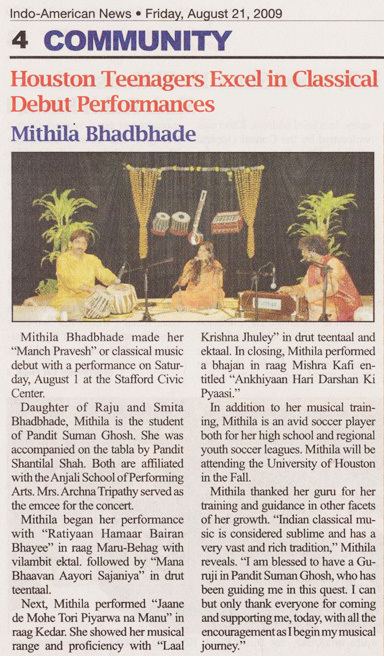 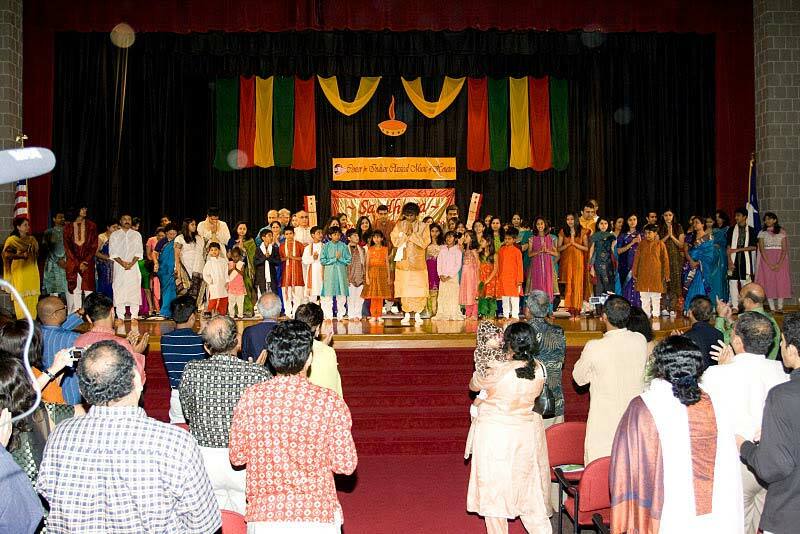 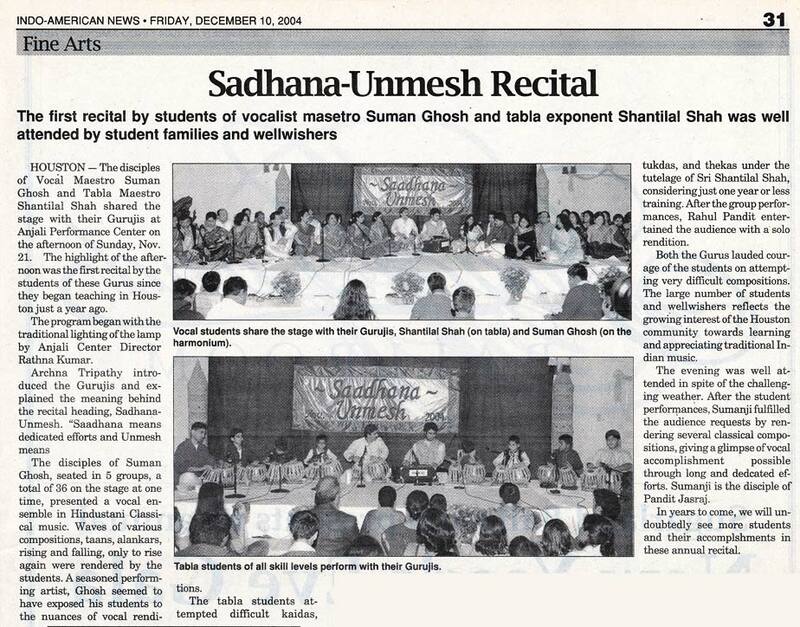 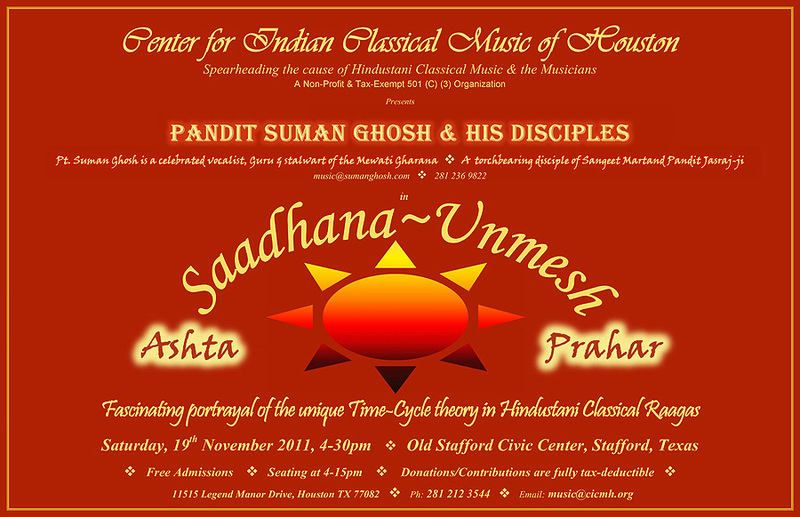 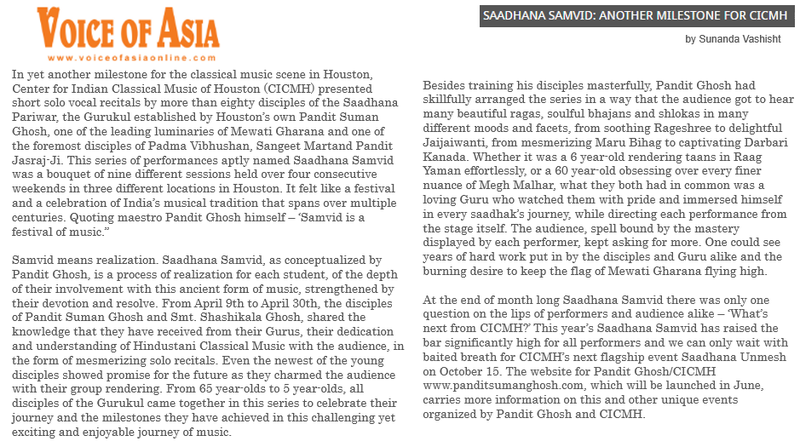 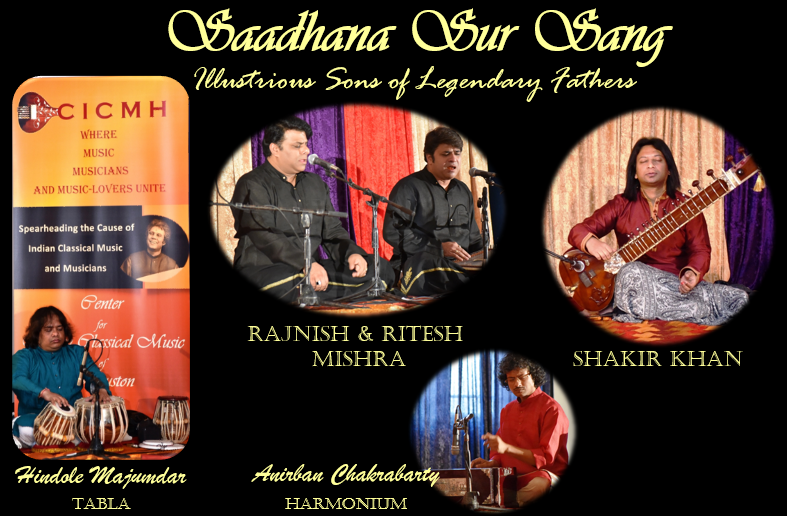 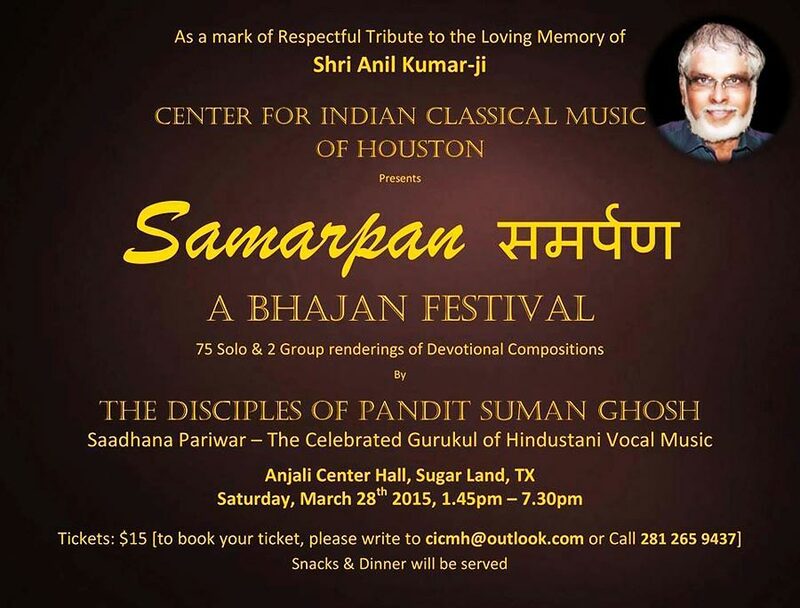 To name a few, Saadhana Samvid – perhaps the only series of performances presented by any Gurukul where majority of its disciples perform solo, offering the audiences a glimpse of their individual musical realizations; Saadhana Unmesh – a grand stage to showcase the disciples’ musical blossoming, and Saadhana Gunateeta Sang – the privilege and blessing to spend an exclusive evening in the presence of none other than their Bade Guruji, living legend of Indian music, Sangeet Martand Pandit Jasraj Ji. 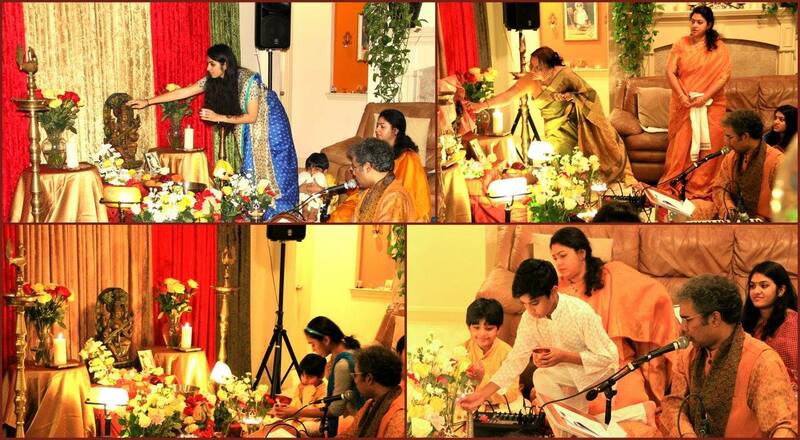 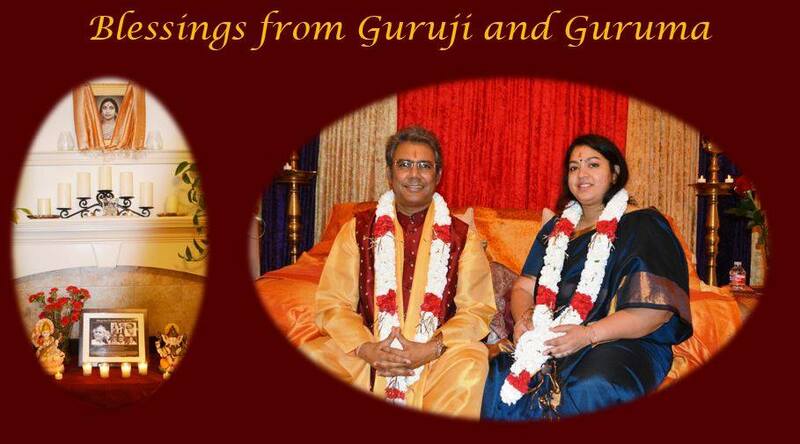 These events enrich the musicality of not just the disciples but their families and friends as well. 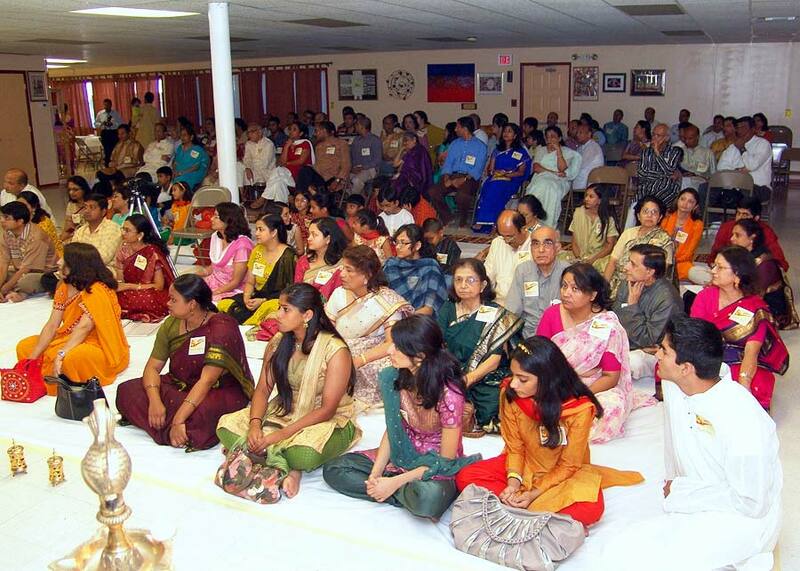 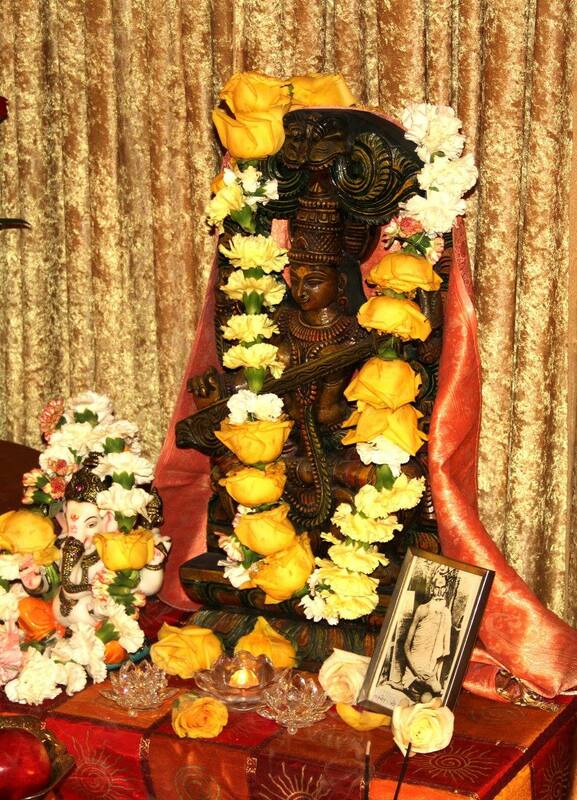 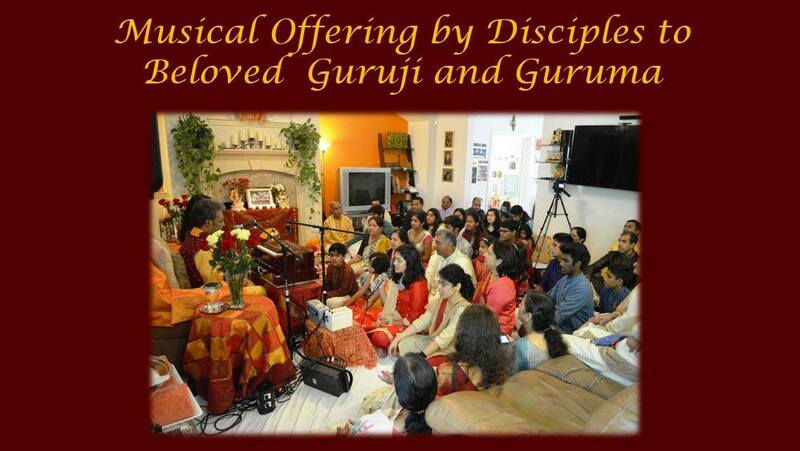 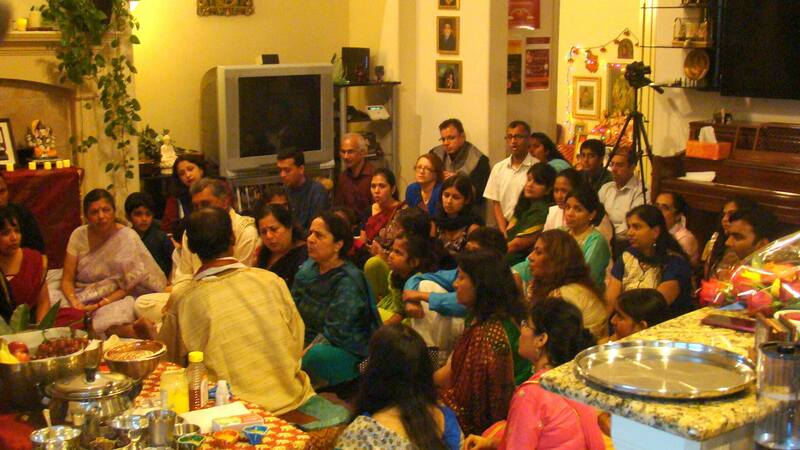 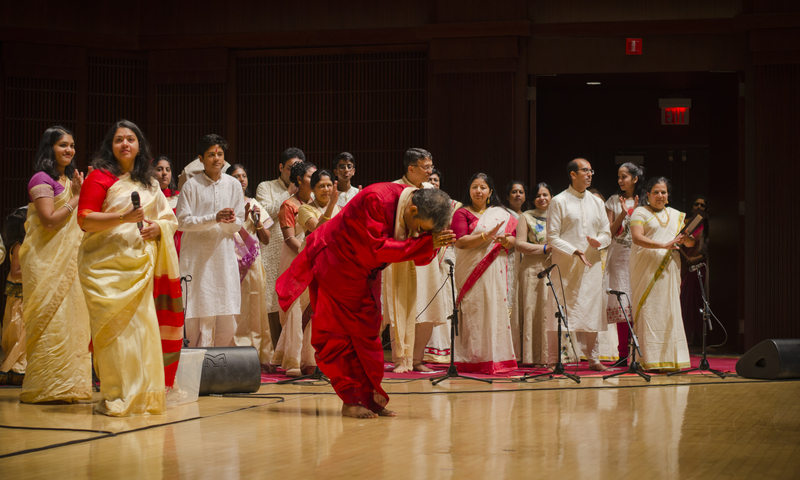 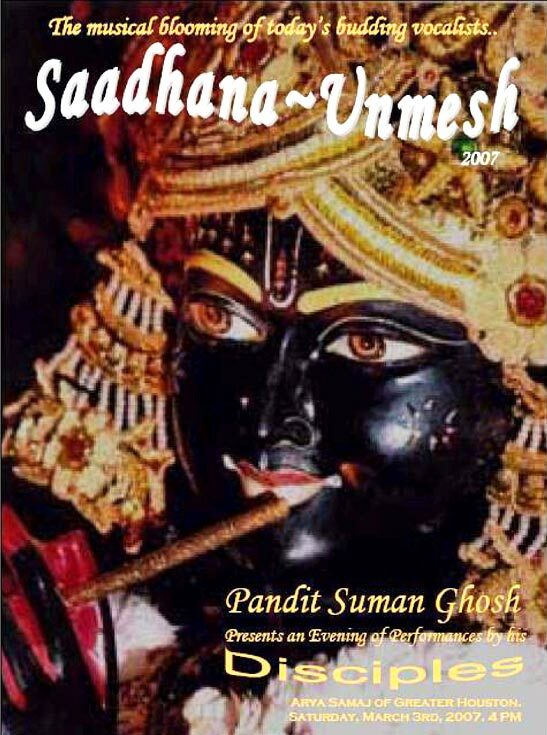 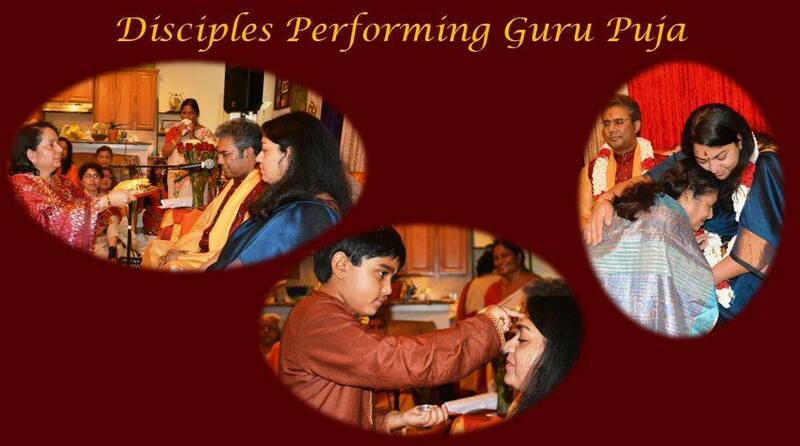 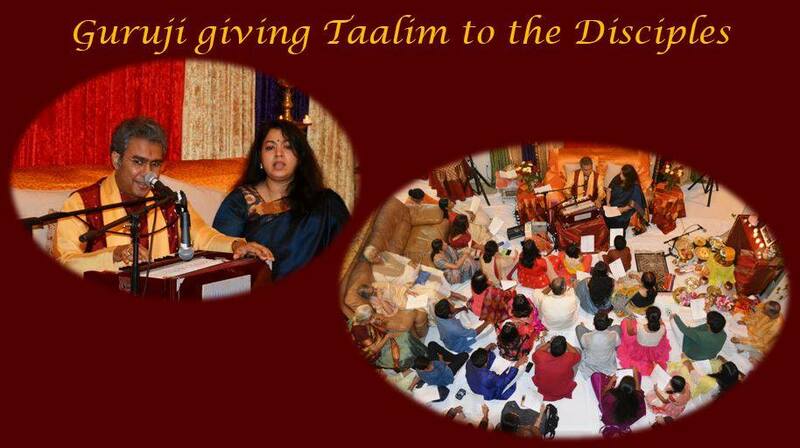 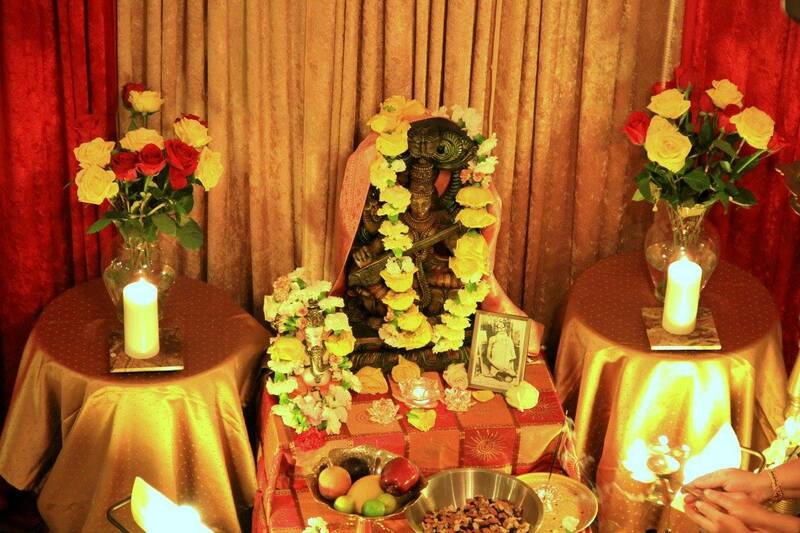 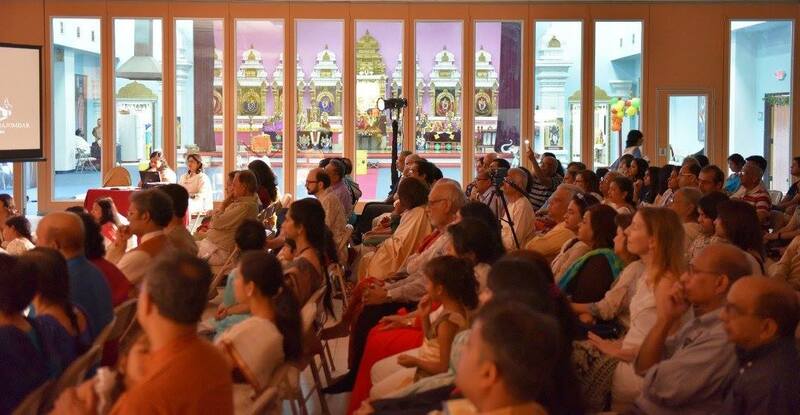 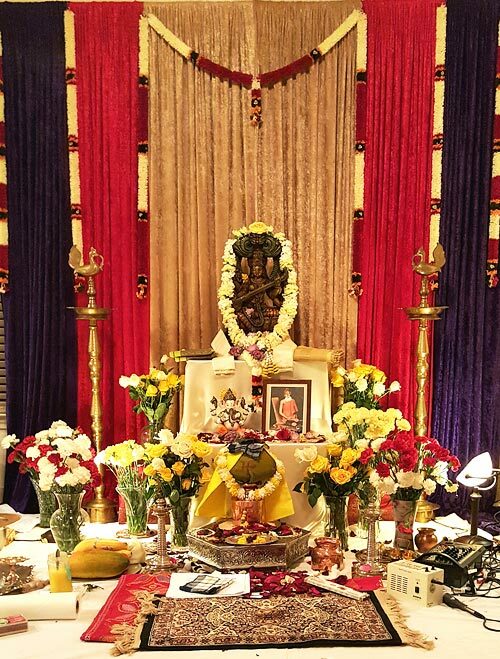 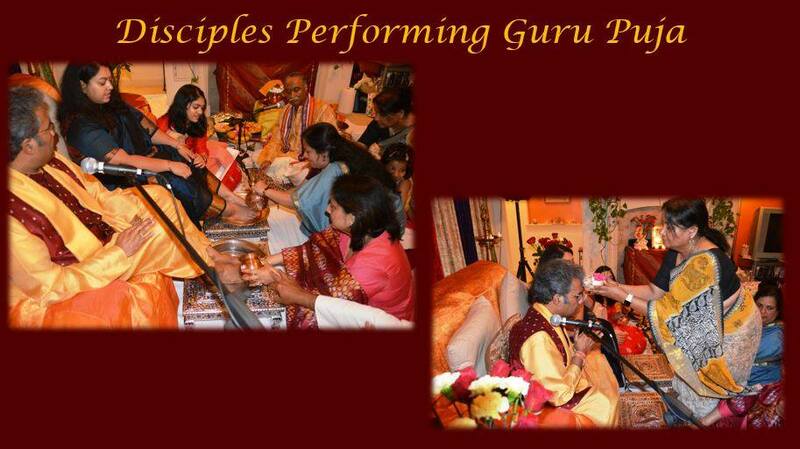 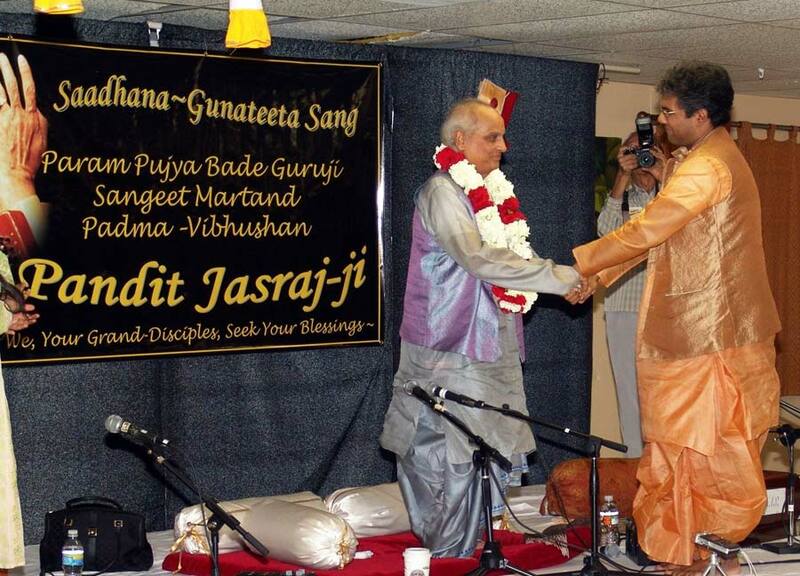 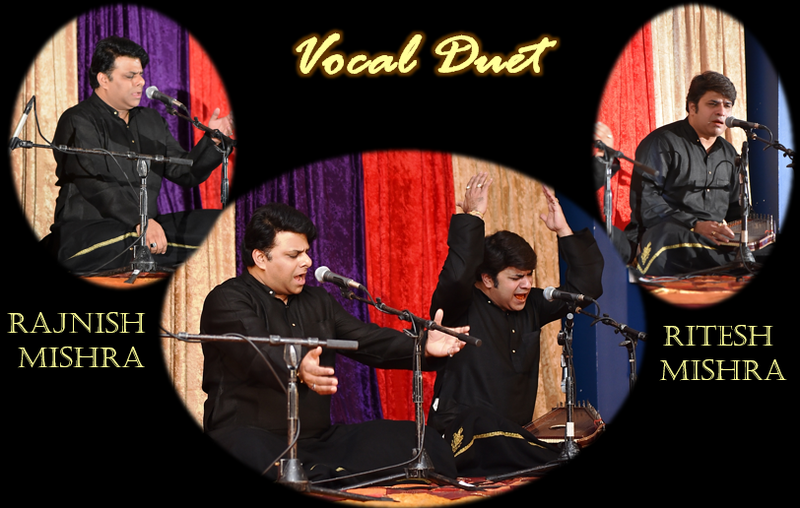 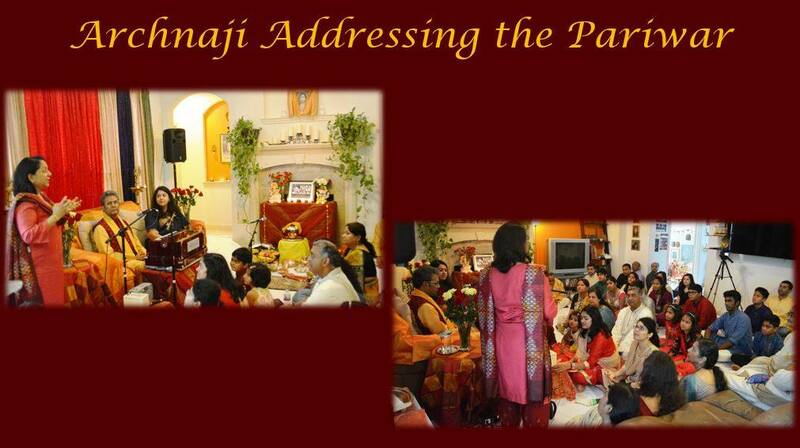 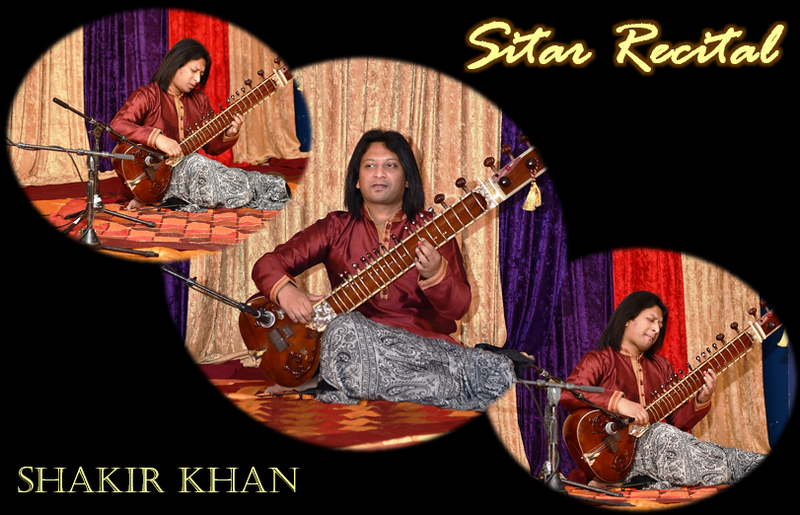 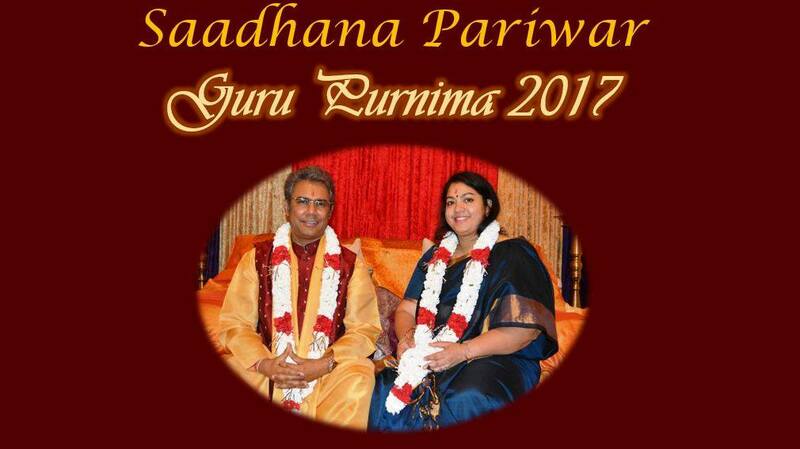 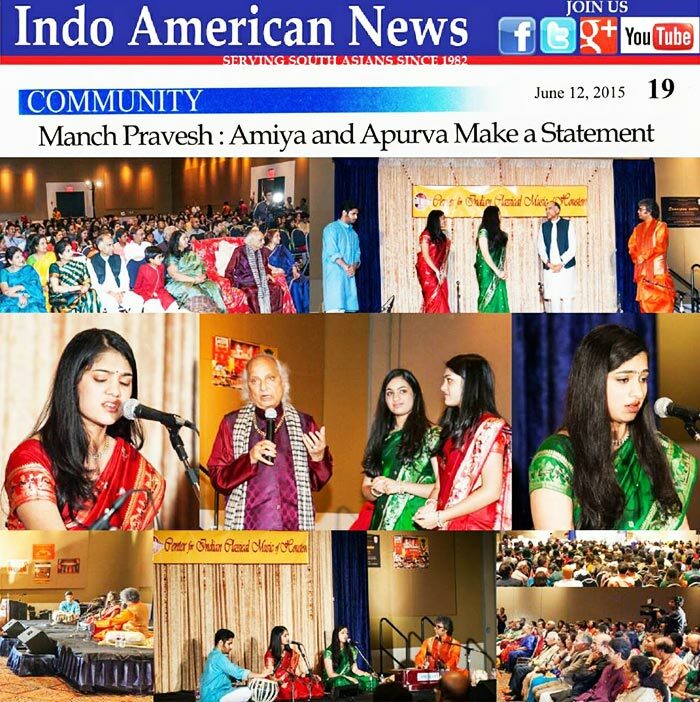 The disciples who go through a sustained and rigorous training and practice to pursue this art-form to an even deeper level, are presented in a Manch Pravesh, or formal stage debut as solo performers. 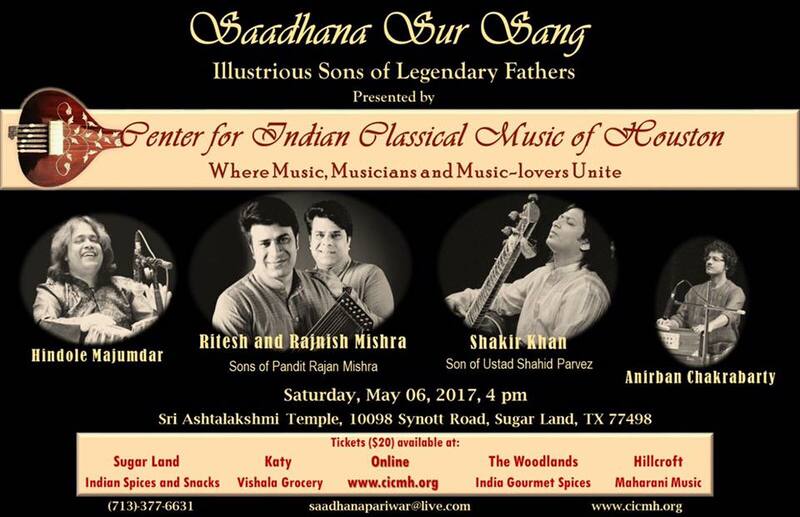 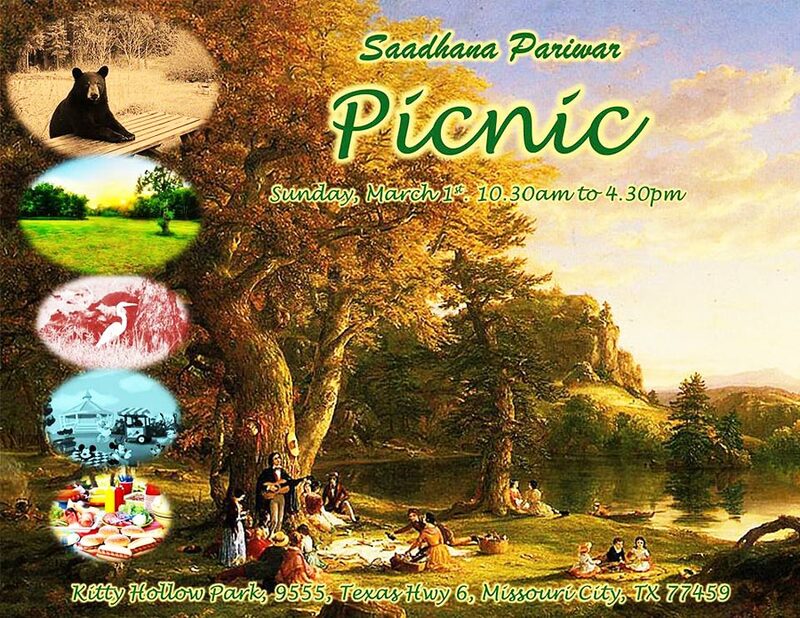 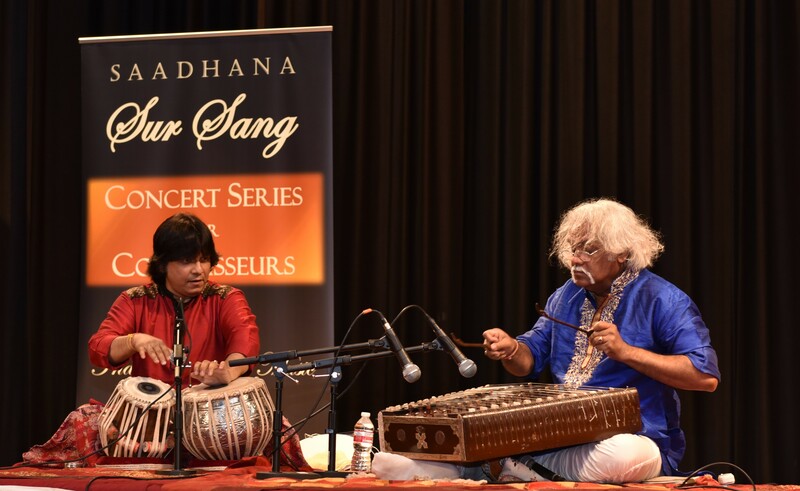 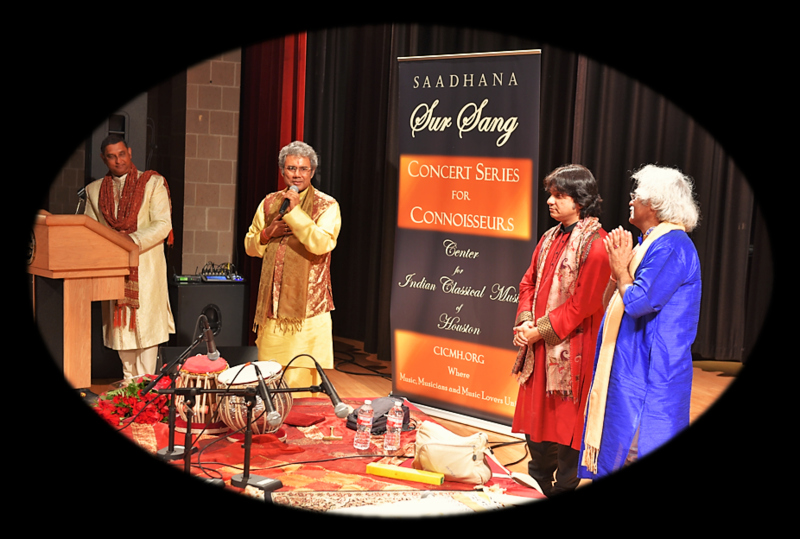 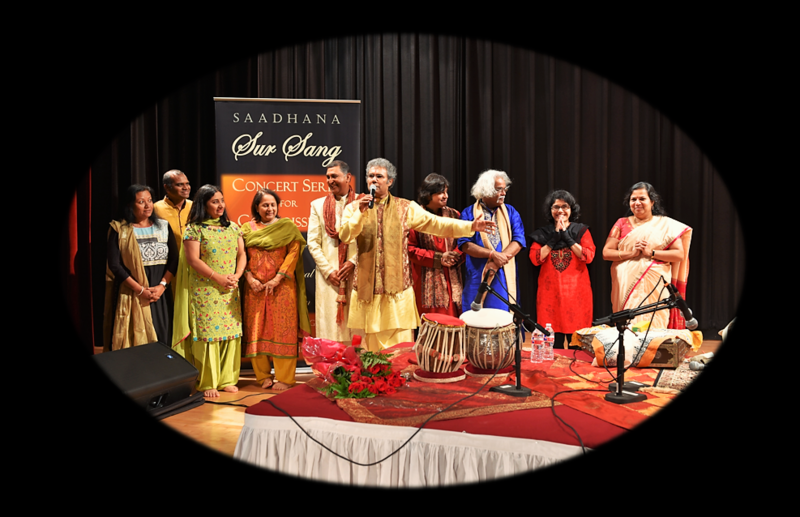 Saadhana Sur Sang, a concert series where CICMH presents professional performers, is a treat for the music-learners and connoisseurs. 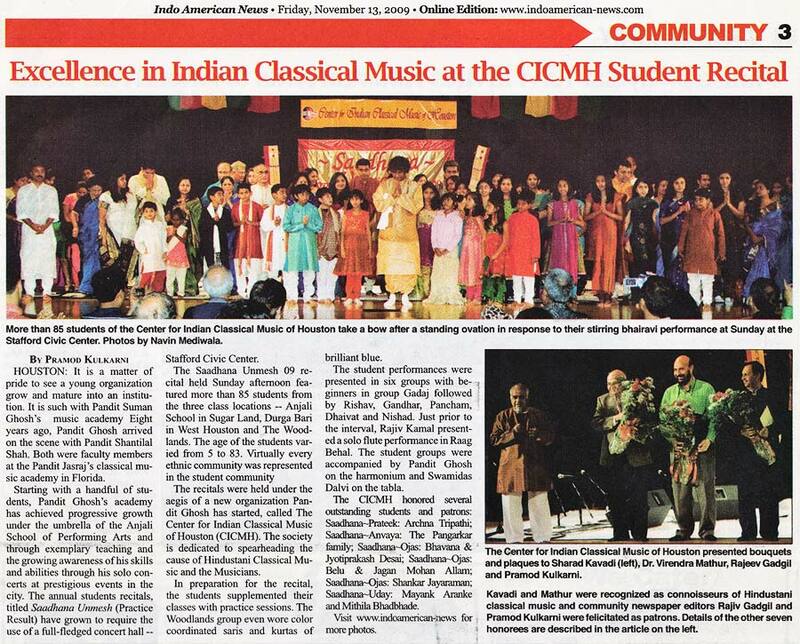 Browse through our CICMH Panorama for more on these events.